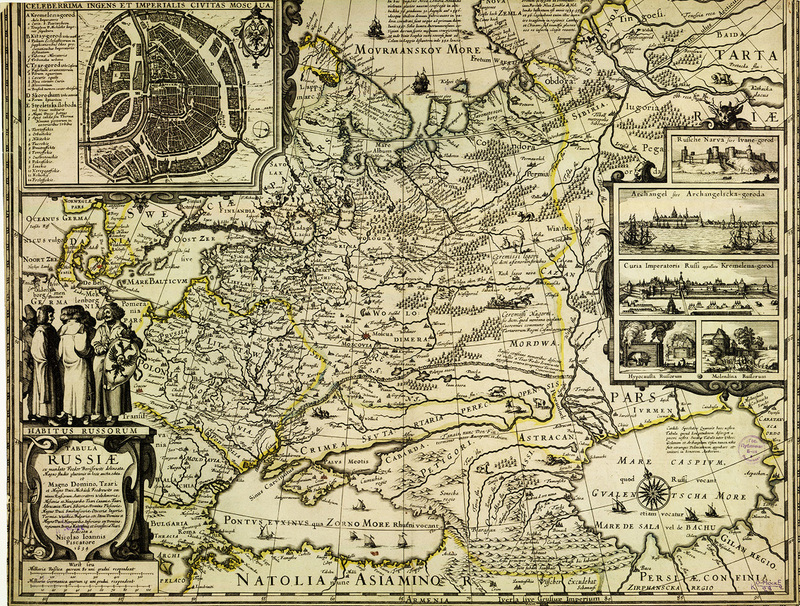 Among the unique cultural heritage preserved in the National Library of Russia, the maps and atlases occupies a special place. 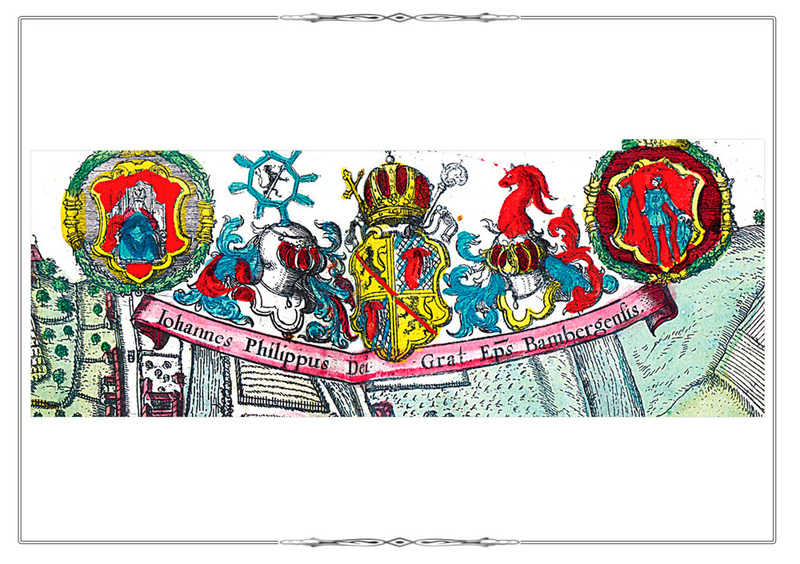 The most valuable portion of them includes Dutch engraved atlases of the 16th-17th centuries. This collection is the largest in the country, it is also regarded as one of the world's important by its size (over 400 items) and a wide scope of authors represented in it. 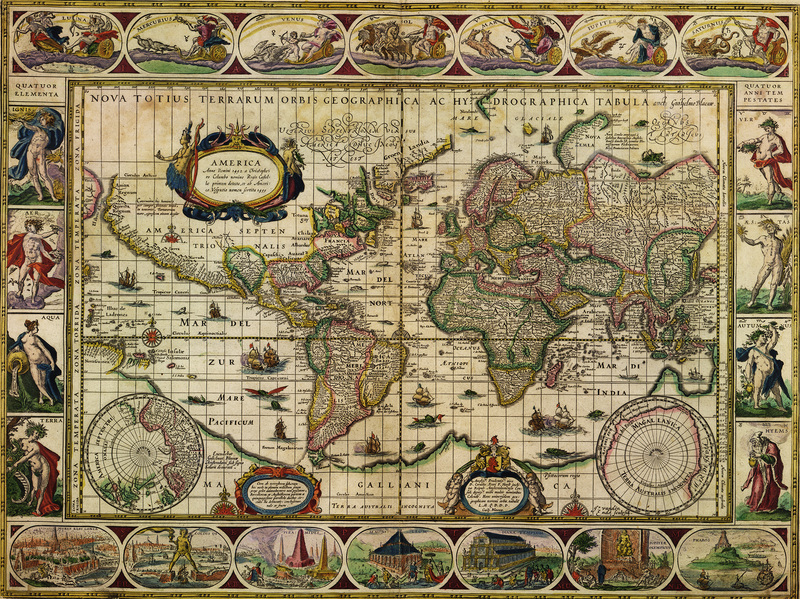 The extensive collection embraces works by members of various Dutch cartographic schools. The most famous Antwerp School map-maker was Abraham Ortelius (1527-1598). 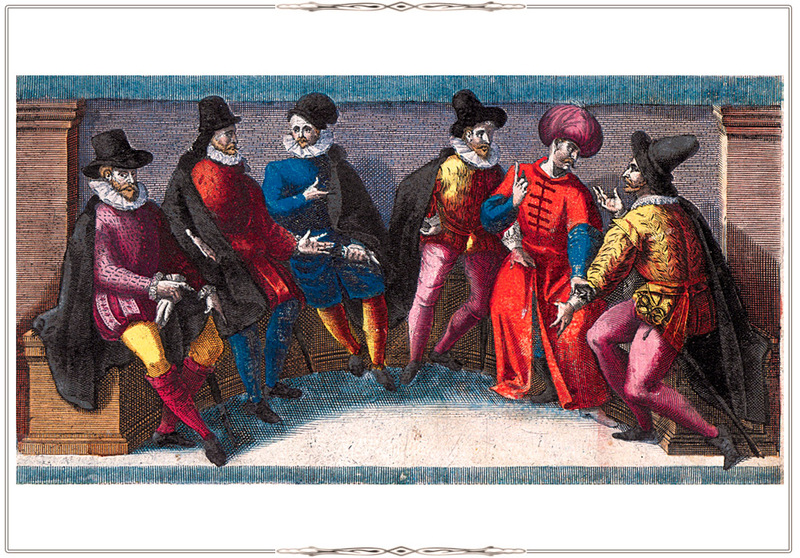 He was the first of his contemporaries to gather extensive cartographic material and published the book of maps of uniform style Тheatrum orbis terrarum – «Theatre of the World» in 1570. Theatrum Orbis Terrarum is considered the first true morden atlas. 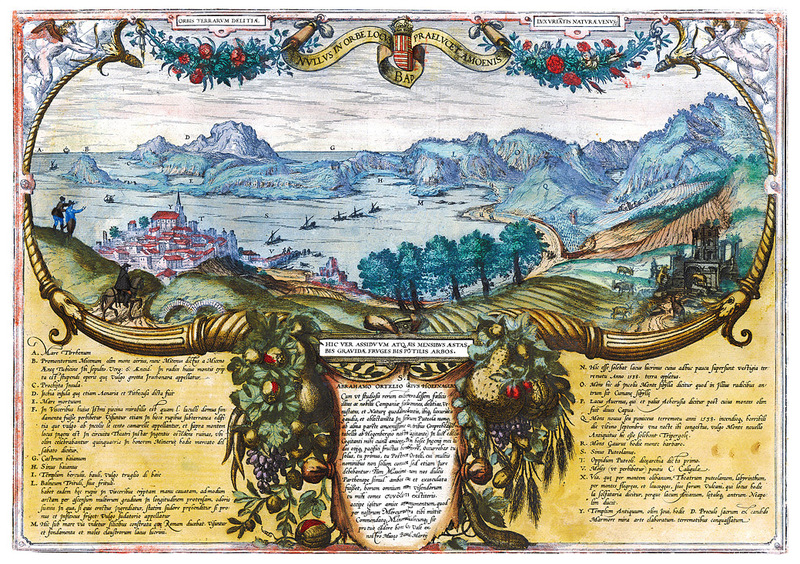 The Ortelius atlas was a huge success and was reprinted many times in different languages from 1571 to 1612. The holdings of our Library contains about 30 editions of this atlas, including the first edition of the atlas, its historical supplement Parergon and a number of smaller format publications of Тheatrum. 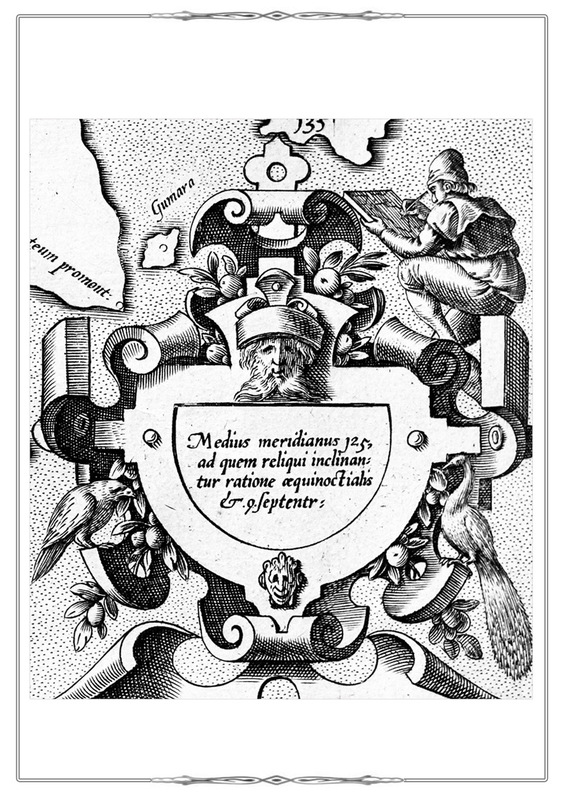 Another prominent cartographer of the 16th century Gerard de Jode (1508–1591) also lived and worked in Antwerp where he published his outstanding atlas in 1578. 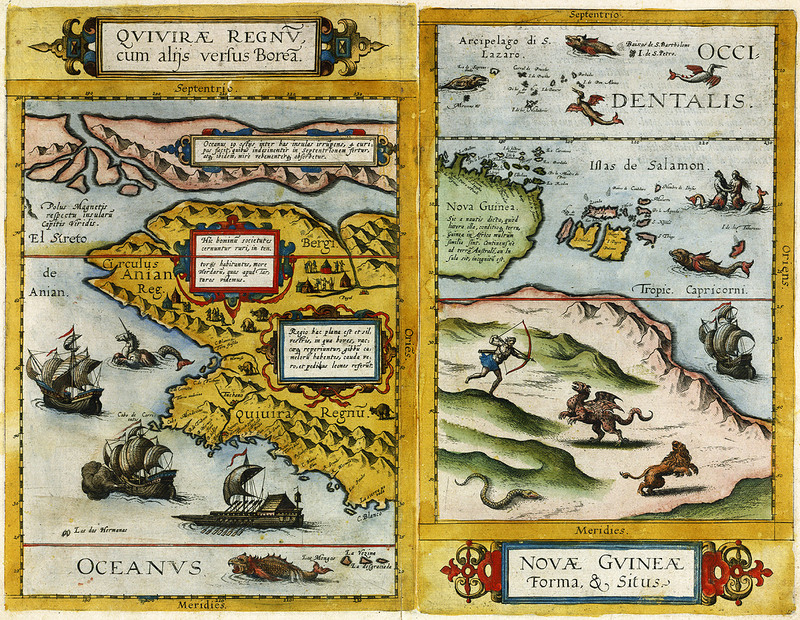 In 1593, his son Cornelis de Jode (1568-1600) issued the second edition of this atlas. It should be noted that there is only one extant copy of this atlas in Russia, which is stored at our Library. 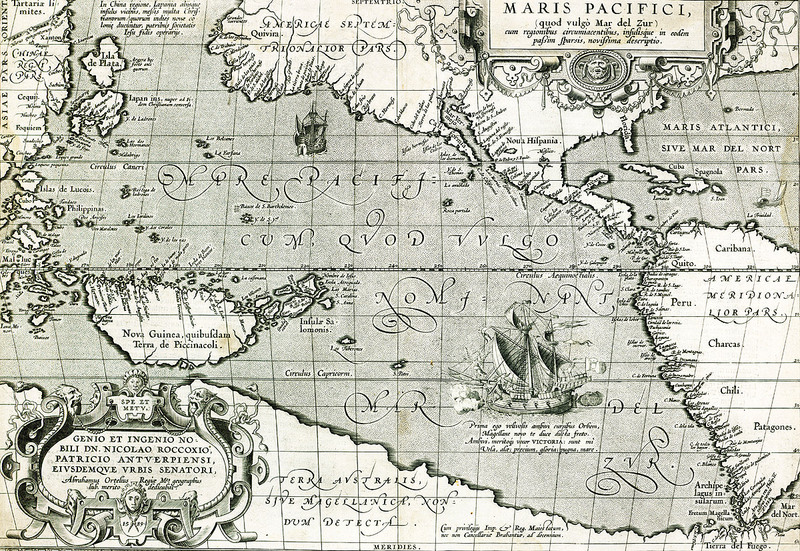 The Library also holds the country's largest collection of the works of Gerardus Mercator (1512-1594). 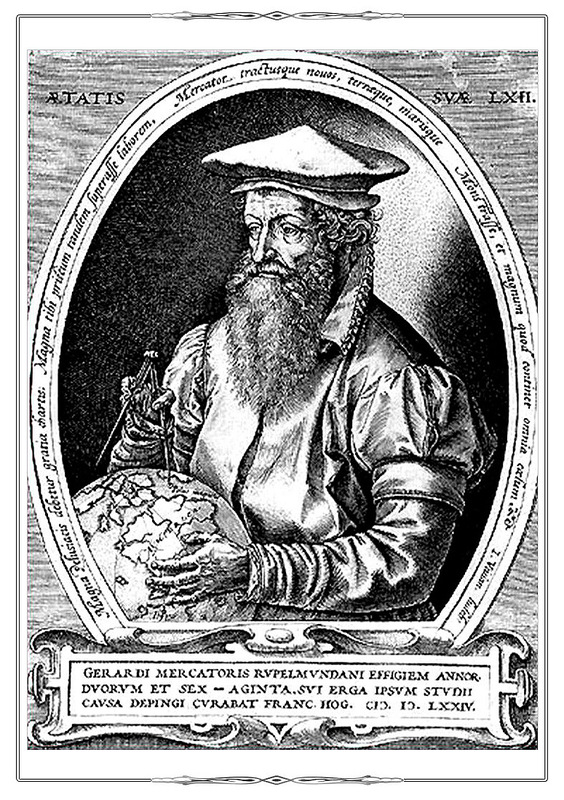 Mercator was the greatest reformer in mapmaking who invented a new map projection that was widely used for navigation. He considered the founder of modern scientific cartography (view also the online exhibition «Atlant of World Cartography»). The collection of cartography houses over 20 volumes of different variants of the renowned «Atlas of Cities of the World» by George Braun (1541-1622) and Franz Hogenberg (1535-1590) , as well as numerous works of the largest mapping company of the 17th century, established by Willem Blaeu (1571-1638). 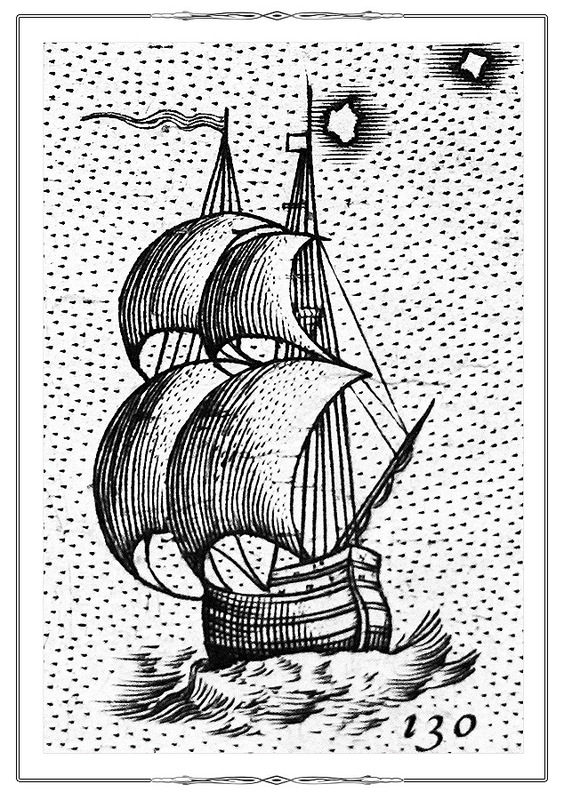 The Library possesses copies of the first ever printed maritime atlas by Lucas Janszoon Waghenaer (died in 1598) Spiegel der seefart... (Amsterdam , 1589) - 'Mariner's mirror' and his second atlas Thresorie ou cabinet... (Amsterdam, 1606). 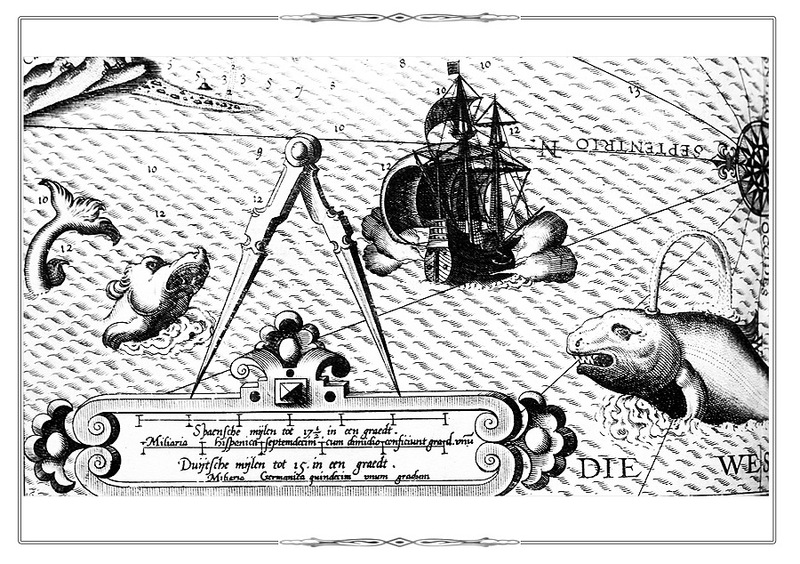 The role that Waghenaer played in the development of nautical chart-making is no less important than the contribution of Ortelius to the creation of the world atlas. 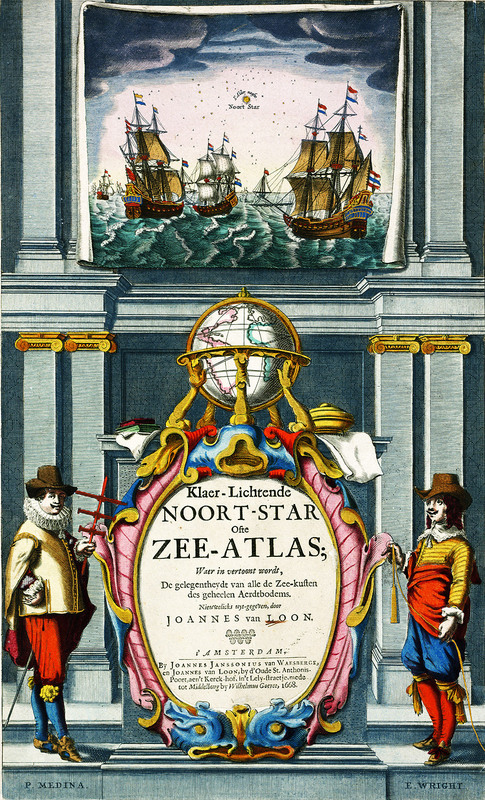 Maritime atlases are also represented by works by Pieter Goos, Jan van Loon, Claes Vogt, Gerard van Kelen, etc. These publications are remarkable milestones in the history of cartography, the extant editions are not only valuable sourses of contemporary geographic knowledge but also fine works of art. The Dutch cartographers of the 16th - 17th centuries made an unprecedented contribution to the art of map design. - artists, engravers and mapmakers belonged to the same group of society that determined the development of culture in many areas. 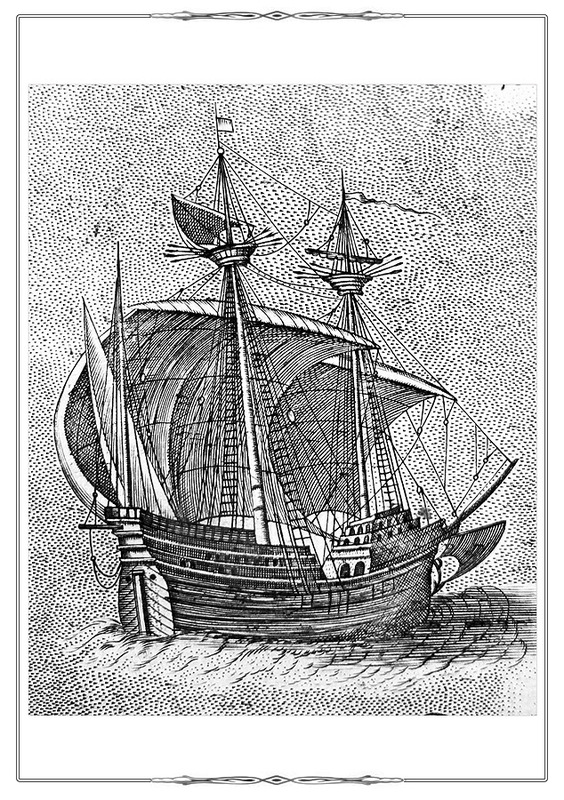 An image in the center of the map depicts Ferdinand Magellan's (1480-1521) ship "Victoria" which completed the first circumnavigation of the world. 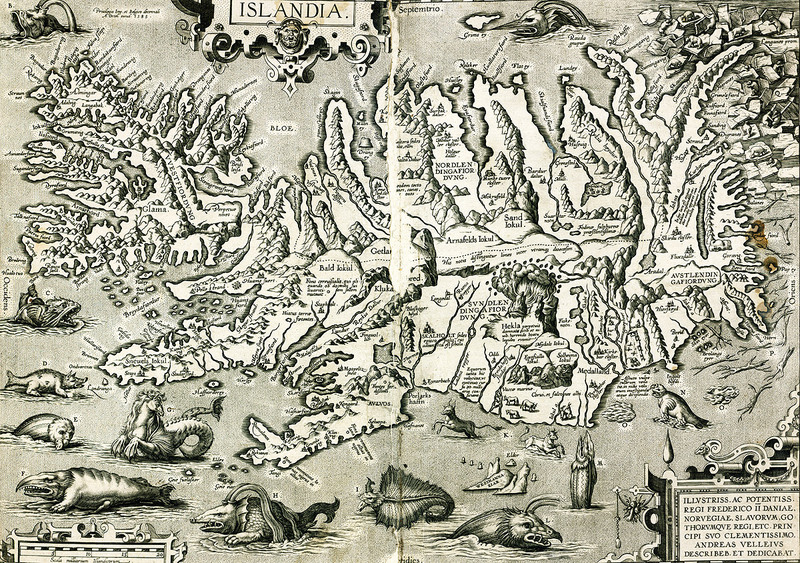 Map of Iceland from the atlas «Theatre of the World». 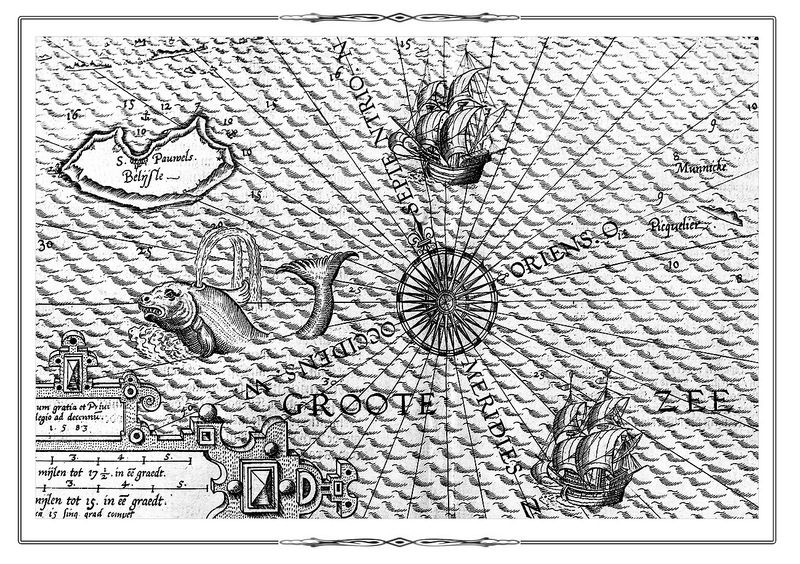 The map shows fantastic sea animals in the surrounding waters. Fragment [p. 286] from the atlas Theatrum orbis terrarum. Antverpen, 1584. Fragment [p. 60] from the atlas Geographiae libri octo…. Amsterdam, 1605. Fragment [p. 226] from the atlas Theatrum orbis terrarum. Antverpen, 1584. Fragment of page 8 from the atlas Spiegel der seefart... Amsterdam, 1589. Fragment [p. 61] from the atlas Theatrum orbis terrarum. Antverpen, 1584. 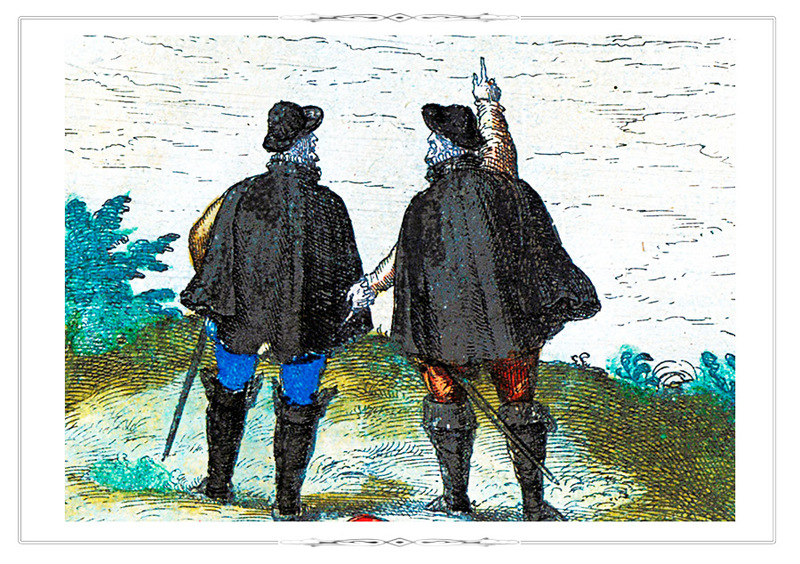 Fragment of p. 16 from the atlas Spiegel der seefart... Amsterdam, 1589. Fragment [p. 296] from the atlas Theatrum orbis terrarum. Antverpen, 1584. 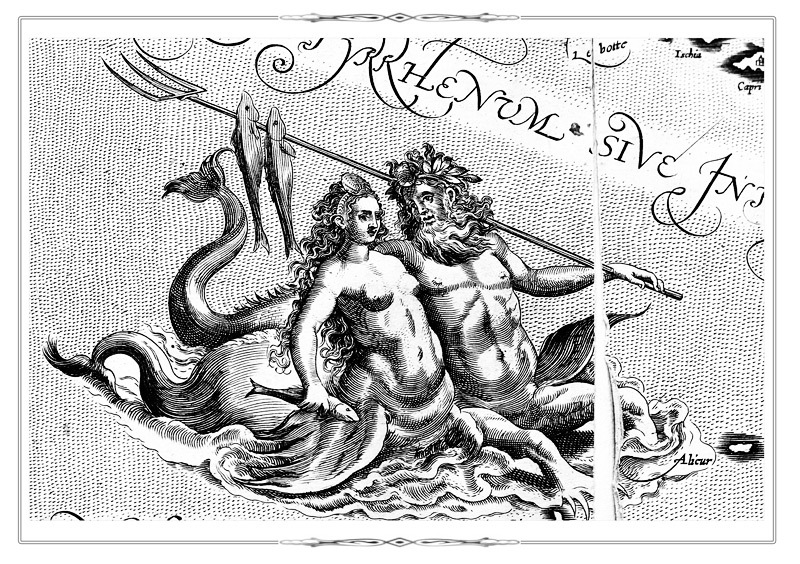 Fragment of p. 12 from the atlas Spiegel der seefart... Amsterdam, 1589. Fragment [p. 330] from the atlas Theatrum orbis terrarum. Antverpen, 1584. Fragment [p. 9] from the atlas Theatrum orbis terrarum. Antverpen, 1584. 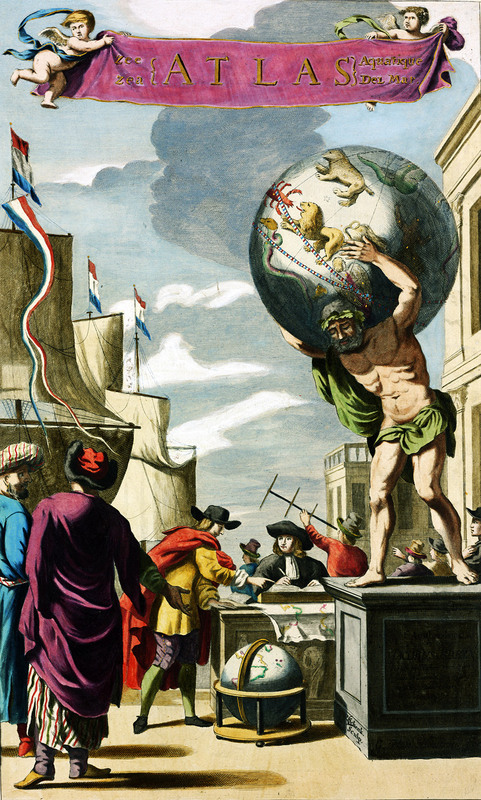 Theatrum orbis terrarum sive Atlas novus…Amsterdam, 1645-1650. Vol. I. F.A. 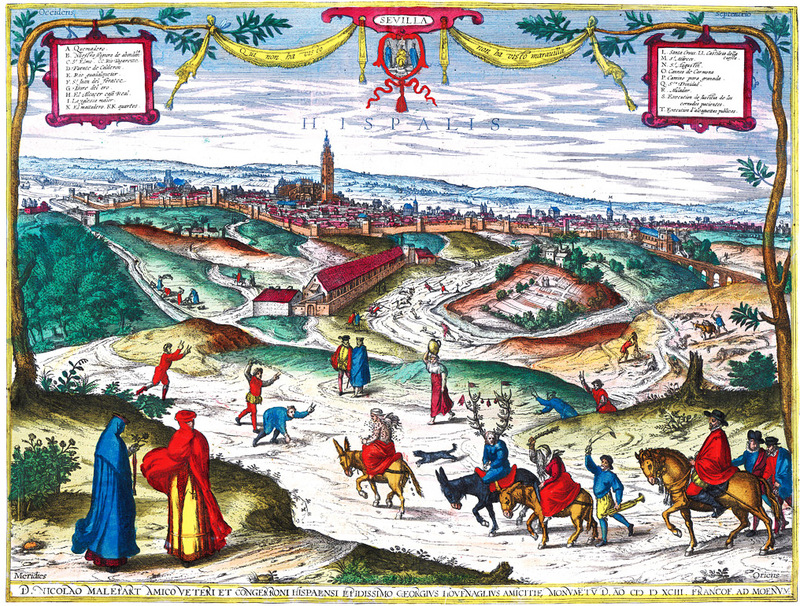 Map of the World from the first volume of the atlas «Theatre of the World…», fol. А. In the margins are allegorical images of the planets (Moon, Mercury, Venus, Mars, Jupiter, Saturn) and the Sun; four elements (fire, air, water and land); seasons. Title page of the atlas Civitates Orbis Terrarum. Köln, 1572-1618. Vol. IV. Urbium praecipvarum totius mundi liber quartus 1588. 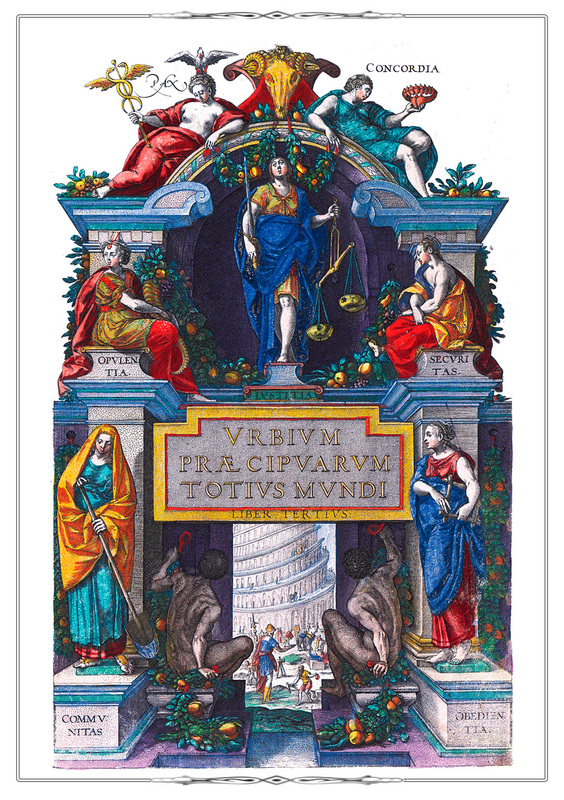 Images on the title page glorify the triumph of human values. A figure of Honor is shown at the top of the page. Permanence and Dignity can be seen below on the left and right. 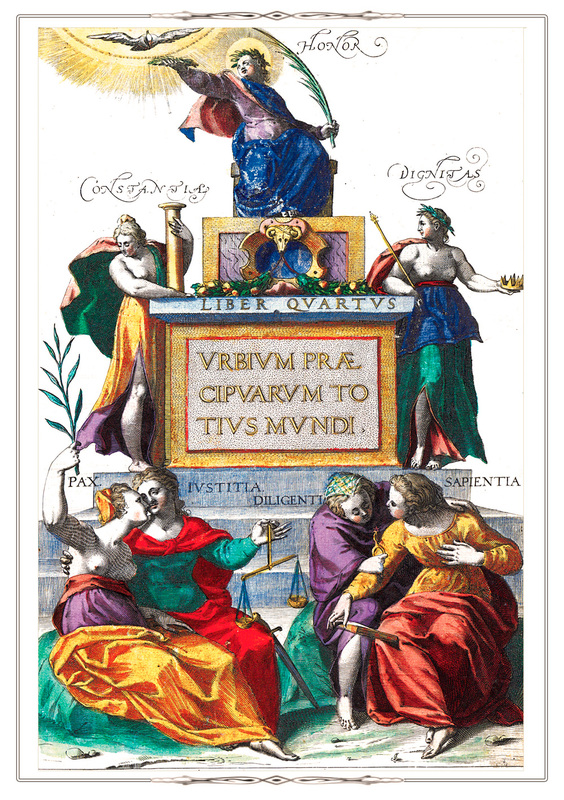 The bottom of the page is decorated with personifications of Peace, Justice, Prudence (Economy, Thrift) and Wisdom. 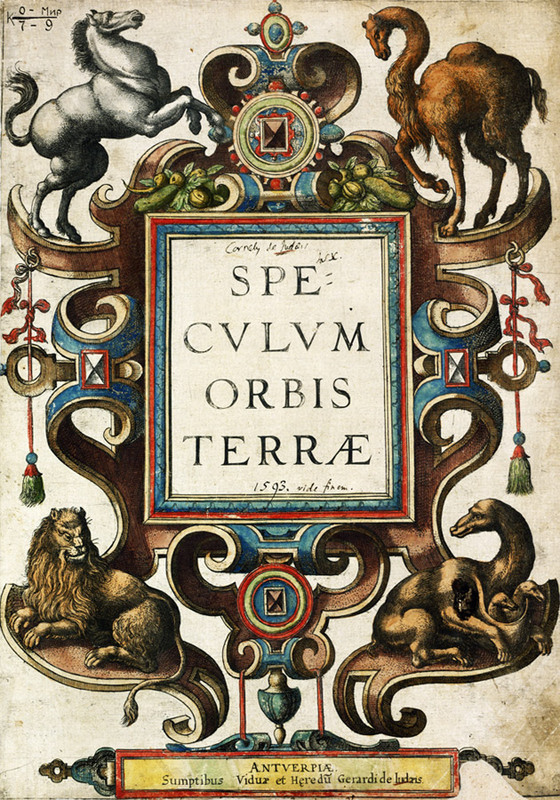 Title page of the atlas Civitates Orbis Terrarum. Köln, 1572-1618. Vol. III. Urbium praecipvarum totius mundi liber tertius.1581. 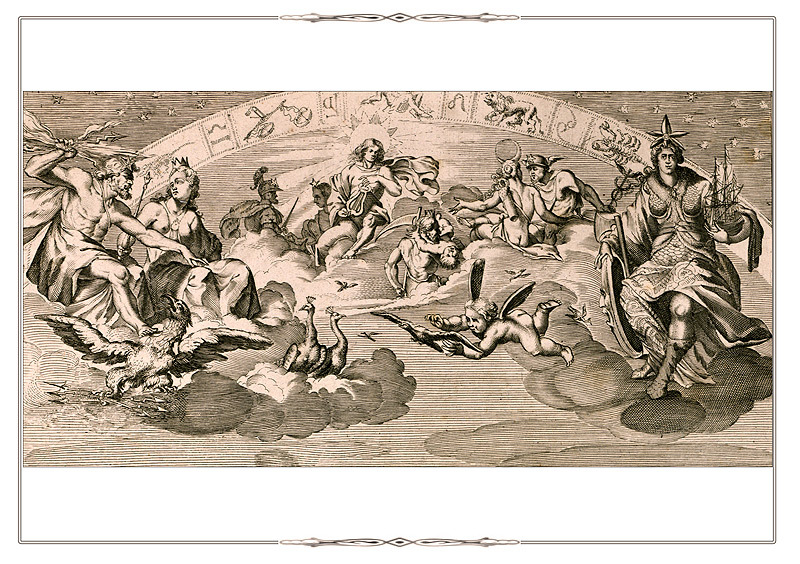 Title page of the atlas is decorated with images that reflect the general idea that the city society is governed by justice, peace, safety. At the top of the page are placed figures of Peace and Consent. The female personification of Wealth and Power can be seen below on the left. In the center is Justice. Security (Safety) is depicted to the right. At the bottom of the sheet are figures symbolizing Society and Conformity to Rules and Laws. 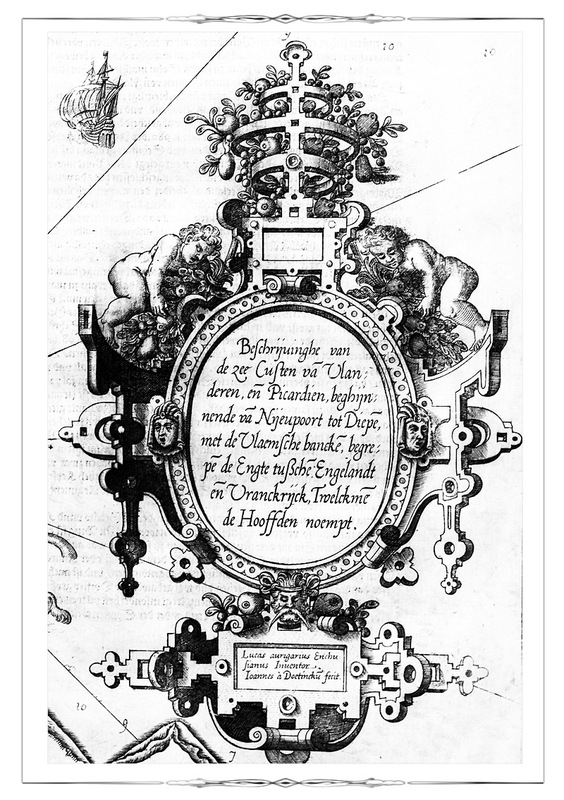 Title page of the atlas «The Nouveau Grand Sea Illuminating Torch…». 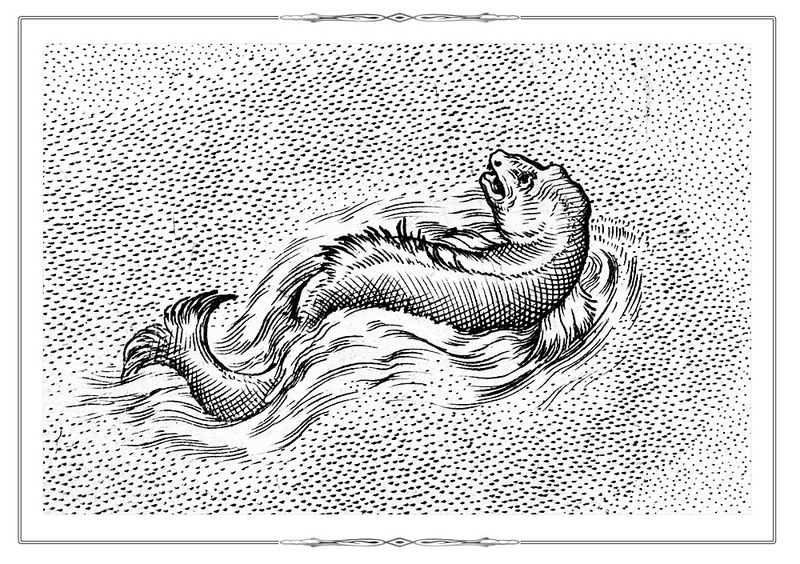 (Le Noveau et Grand Illuminant Flambeau de la mer…. Amsterdam, 1681-1683. Vol. V.). 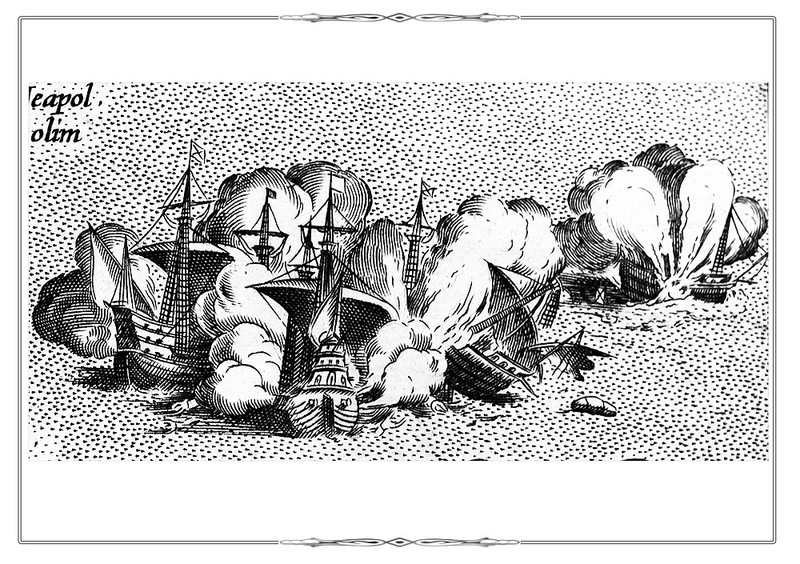 The fifth volume contains charts of the coastal waters of Africa and Brazil. 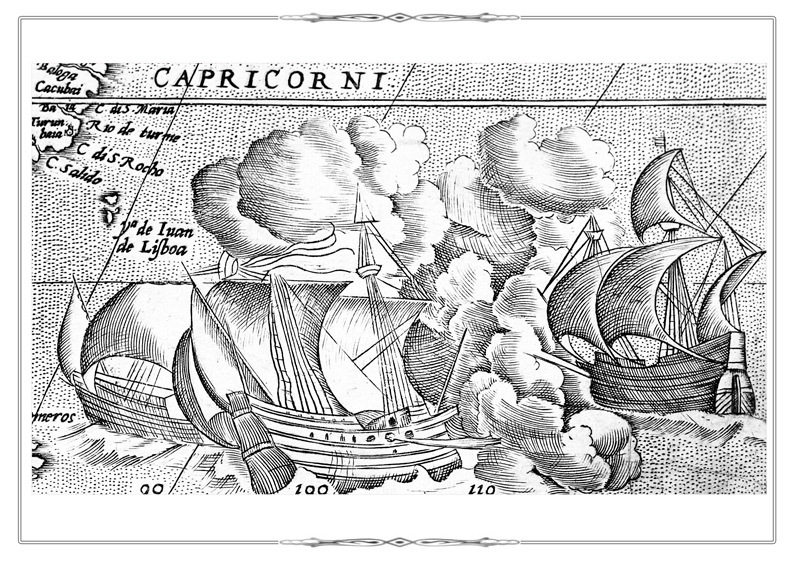 In the center of the sheet is a symbolic image of the Pole Star used by navigators for finding directions. 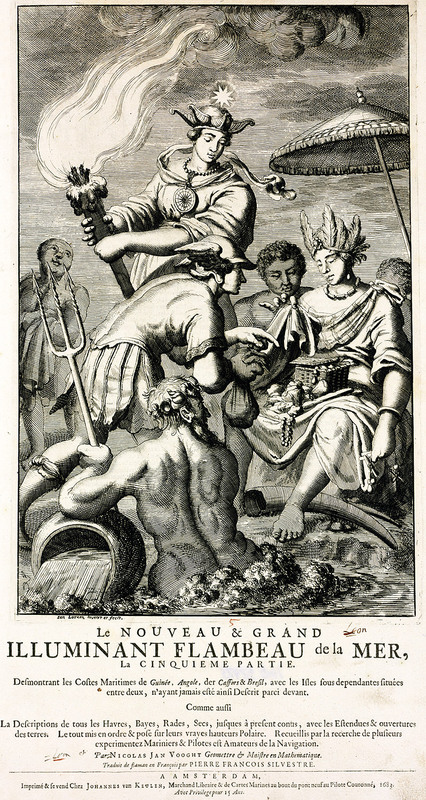 God of Commerce Mercury (Hermes), surrounded with natives, is shown below. Map of Russia. 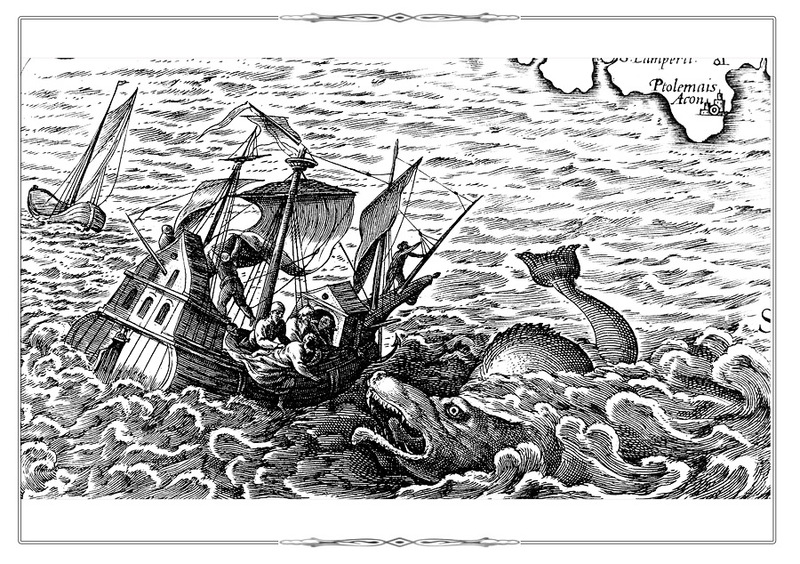 According to the heading of the map, it is based on a drawing by Fyodor Godunov, the son of Tsar Boris Godunov(1589–1605). In 1613, it was first published as part of Mercator's «Аtlas sive cosmographicae…» (Amsterdam, 1619) by heirs of Jodocus Hondius (1563-1612). Later, the map was repeatedly reproduced by other cartographers and placed in various atlases, like this copy of the map issued by Nicholas Visscher (1618-1679). The map is decorated with views of the cities of Ivangorod, Arkhangelsk, the Moscow Kremlin, illustrations of a water mill and a Russian "black" bathhouse without chimney. Fol.6 from the atlas Civitates Orbis Terrarum. Köln, 1572-1618. Vol. 2. De praecipues totius urbibus liber secundus. 1575. (Reduced). Bird's-eye View Plans of Conil de Frontera, Jerez de Frontera (Spain). 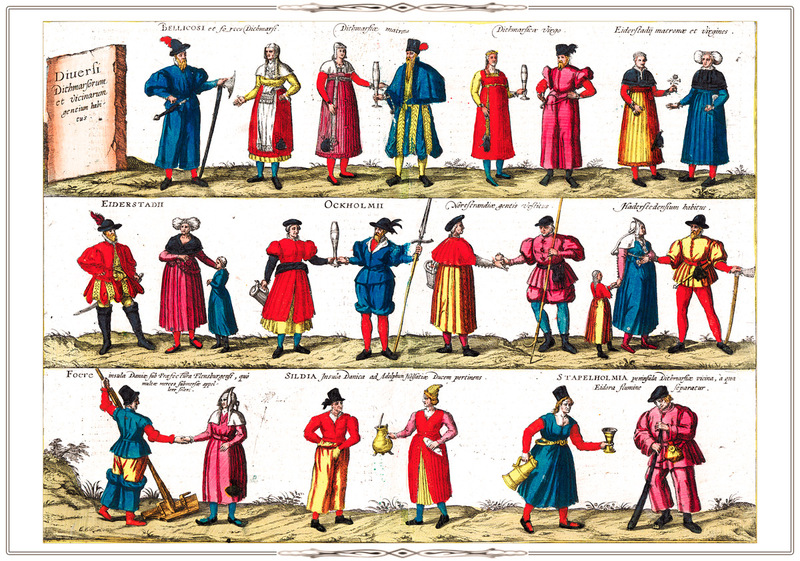 They are notable for detailed images showing local people who work in traditional occupations: fishering and trading. Fragment [p. 40] from the atlas Geographiae libri octo…. Amsterdam, 1605. Fragment [p. 52] from the atlas Geographiae libri octo…. Amsterdam, 1605. Fragment fol. 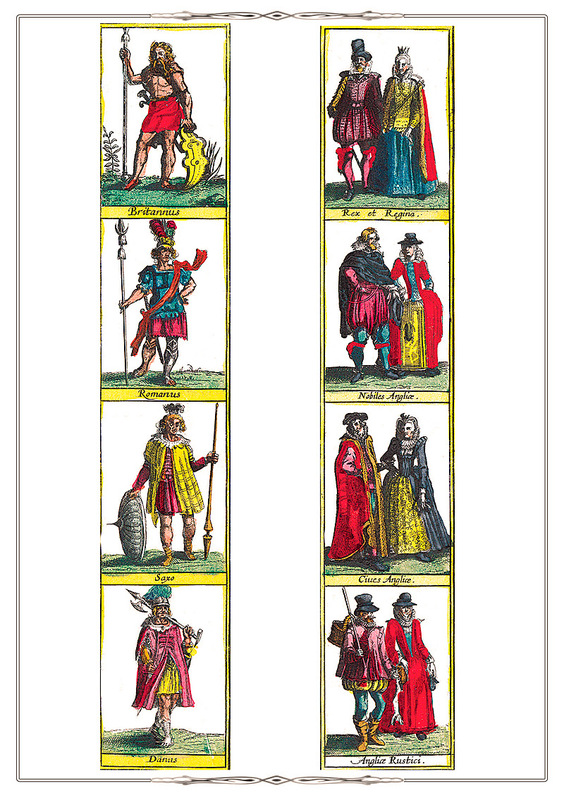 6 from the atlas Civitates Orbis Terrarum. Köln, 1572-1618. Vol.5. Urbium praecipvarum mundi theatrum quintum. Köln, [after 1598]. The picture emphasizes the importance of Cadiz as a big fishing port, a processing center for seafood as well as the leading center of silver jewelry manufacturing and a trade center. Fragment [p. 275] from the atlas Theatrum orbis terrarum. Antverpen, 1592. [Z.275]. 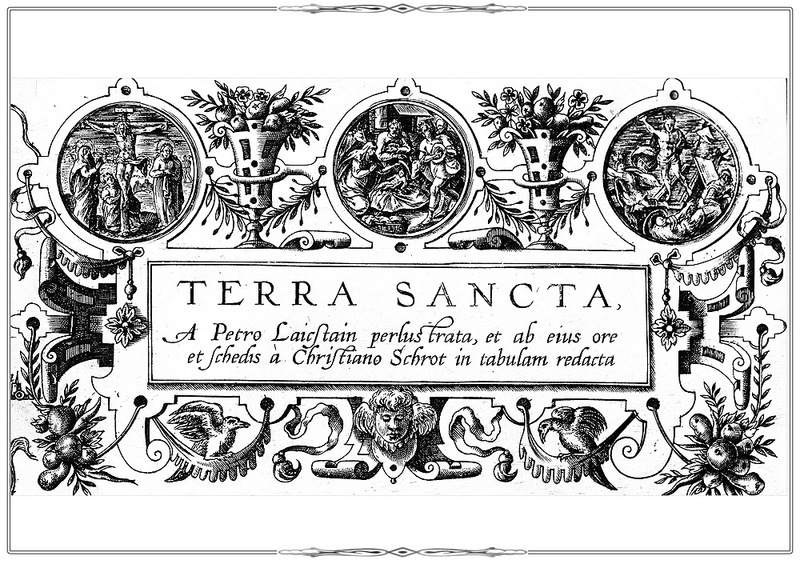 Civitates Orbis Terrarum. Köln, 1588. Vol. III. Urbium praecipvarum totius mundi liber tertius 1588. F.56. Panorama of the Campania region of Italy from the «Atlas of Cities of the World». On the left you can see figures of Abraham Ortelius (1527-1598) and the Dutch artist Joris Hoefnagel (1542-1601). 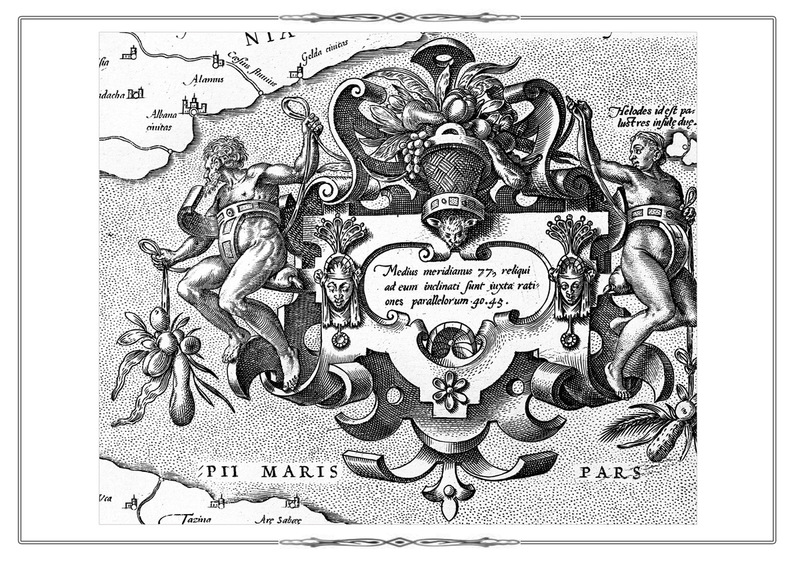 A richly decorated cartouche of fruits, among which are exotic black grapes grown in Campania, symbolizes an abundance of the region. Fragment fol. 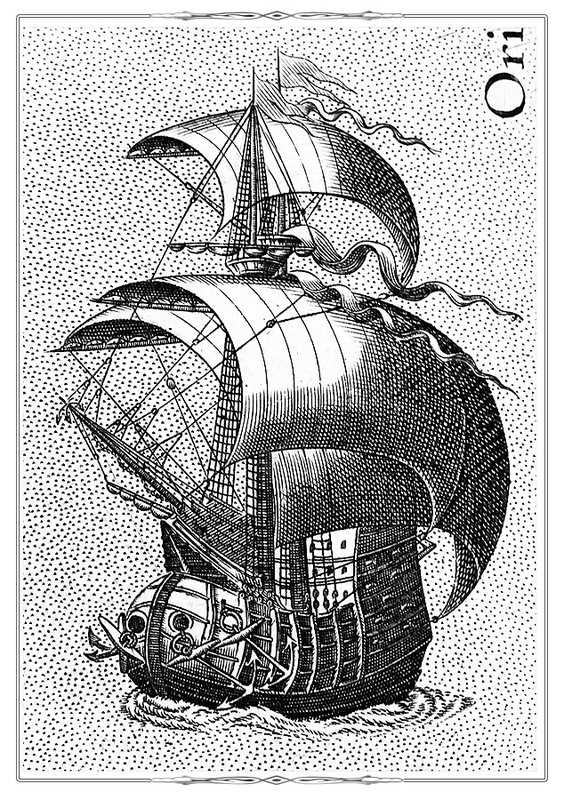 17 from the atlas from the atlas Spiegel der seefart... Amsterdam, 1589. Fragment fol. 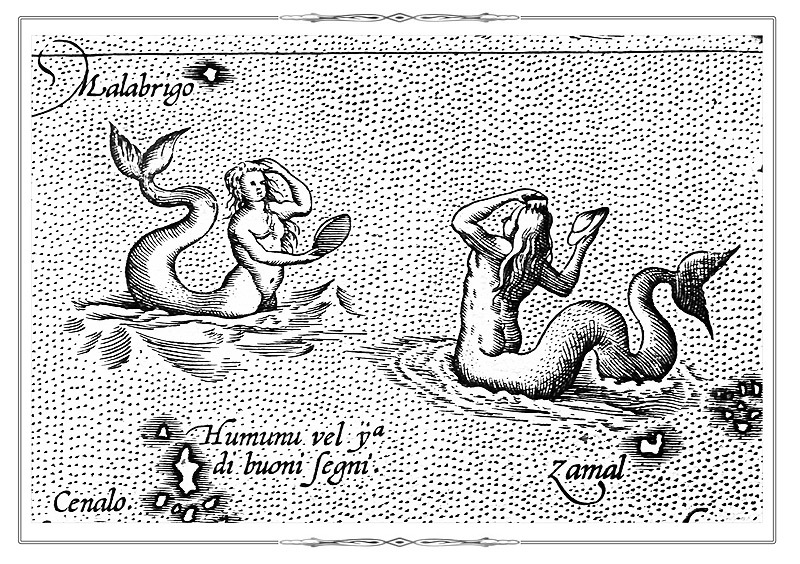 4 from the atlas Spiegel der seefart... Amsterdam, 1589. Fragment [p. 42] from the atlas Geographiae libri octo…. Amsterdam, 1605. 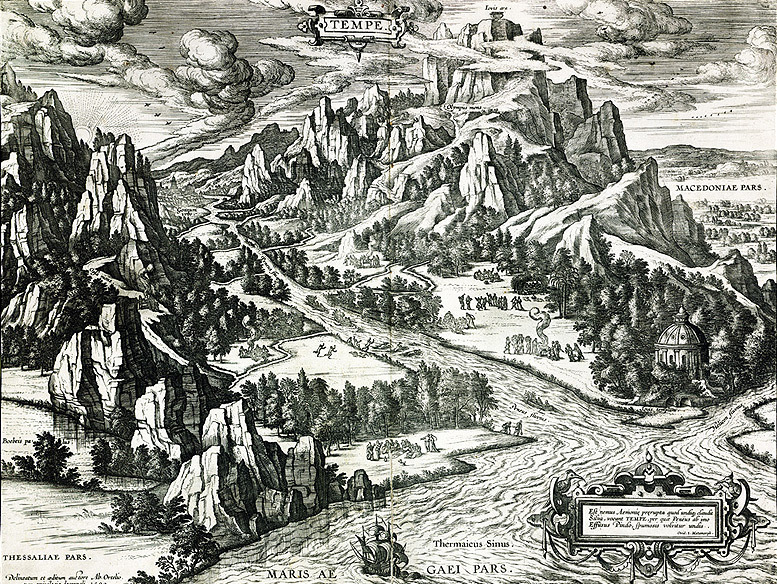 Panorama of the Vale of Tempe and Mount Olympus in Greece from the atlas «Theatre of the World». [p. 275]. The altar of Jupiter is depicted on the top of the mountain, the mythical home of the supreme gods. The temple of Jupiter is shown in the bottom left corner. 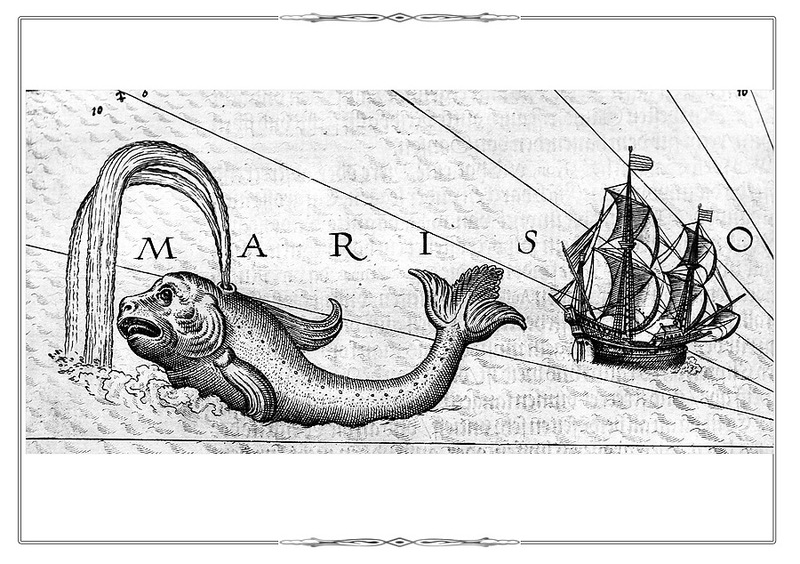 Fragment of the title sheet of the atlas Le Noveau et Grand Illuminant Flambeau de la mer…. Amsterdam, 1681-1683. Fragment of the title sheet of the atlas Civitates Orbis Terrarum. Köln, 1572-1618. Vol. II. The Penates and Lares are good household gods who protected the unity and welfare in the family. 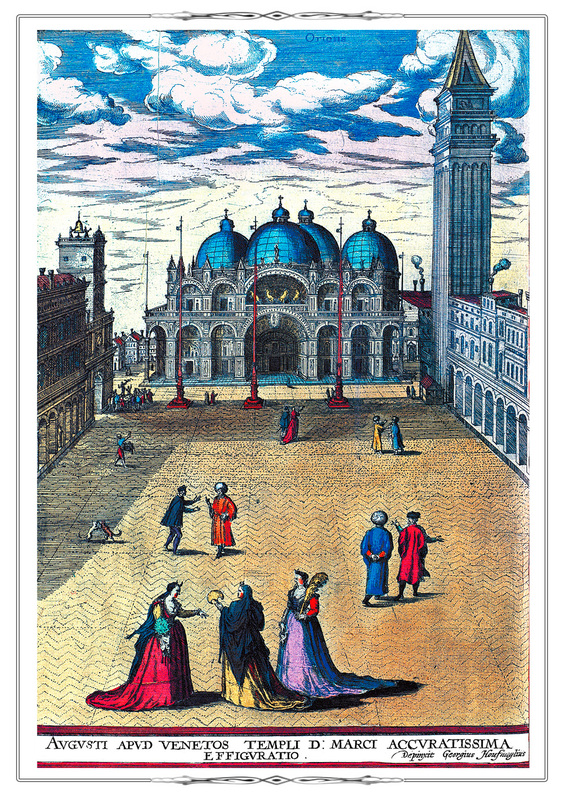 Fragment [p. 194] from the atlas Theatrum orbis terrarum. Antverpen, 1584. Fragment p. 5 from the atlas Theatrum orbis terrarum. Antverpen, 1584. Fragment p.  of the atlas Theatrum orbis terrarum. Antverpen, 1584. Civitates Orbis Terrarum. Köln, [ after 1598]. Vol. 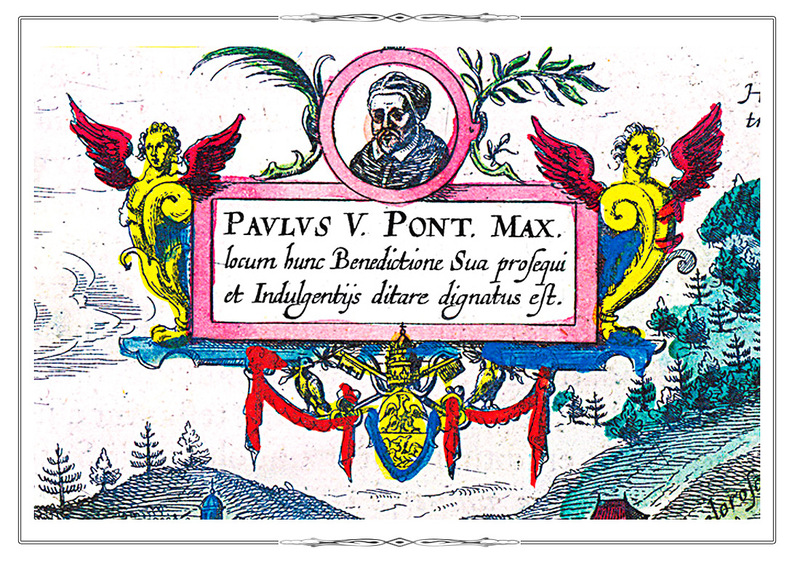 V. Urbium praecipvarum mundi theatrum quantum ( 1598). Fol.7. Plan of Seville from the «Atlas of Cities of the World». Vol.V. Fol.7. 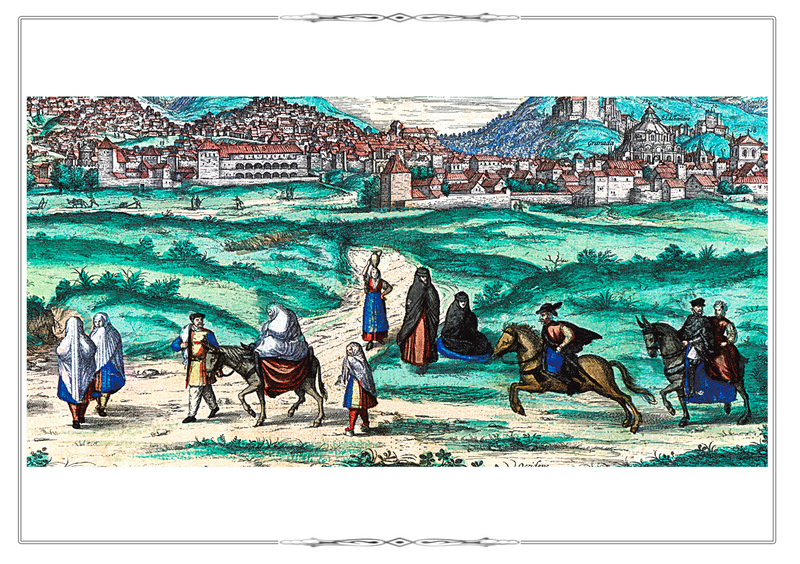 The picture depicts a scene of flagellation: convicted criminals were led through the whole city, and passing by people threw stones and sewage at them. Fragment fol. 4 (a plan of Granada) from the atlas Civitates Orbis Terrarum. Köln, 1588. Vol.I. The expulsion of the Muslims from Spain. Fragment fol. 43 (a plan of Venice) from the atlas Civitates Orbis Terrarum. Köln, 1588. Vol.I. 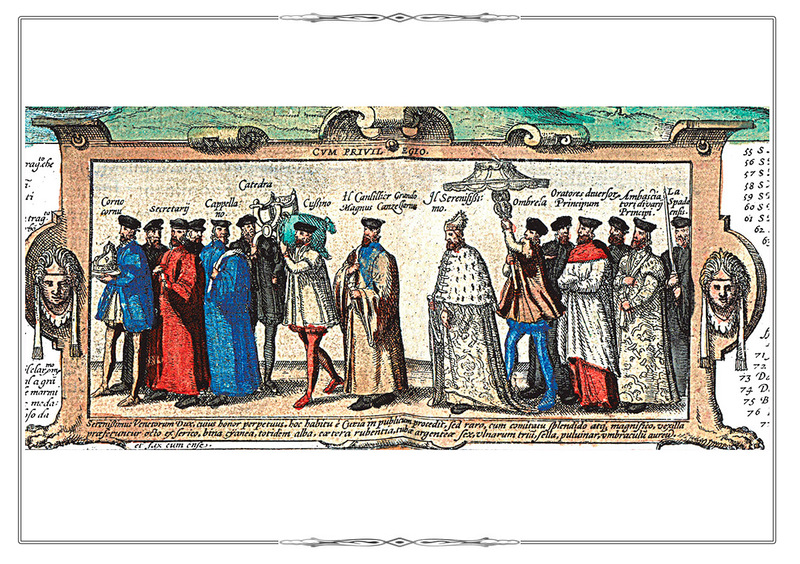 Grand Procession of the Doge of Venice. Fragment fol. 24 (a plan of Sankt Polten) from the atlas Civitates Orbis Terrarum. Köln, 1572-1618. Vol. VI. Theatrum praecipvarum totius mundi urbium liber sextus. 1617. 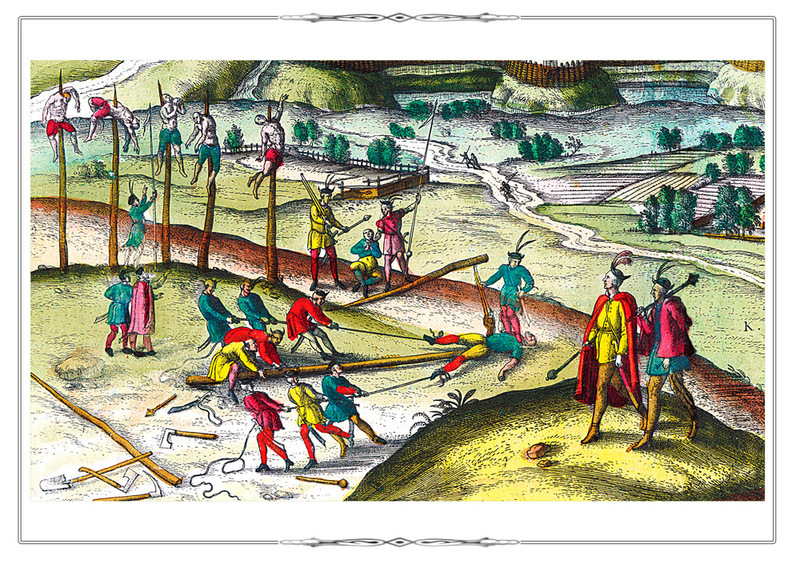 The picture shows the suppression of the peasant anti-feudal uprising in Austria during 1595-1597. Fragment of a plan of Grodno, dating back to the Livonian War (1558-1583), features the meeting the Russian mission who arrived to attend the 1567 Seim assembled by Polish King Sigismund II Augustus (1520-1572). Civitates Orbis Terrarum. Köln, 1588. Vol. I . F.51. 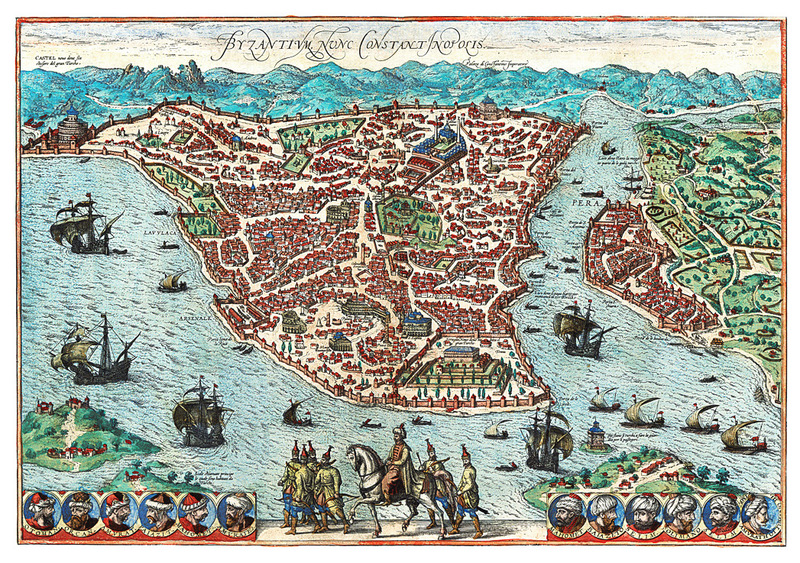 Plan of Constantinople (now Istanbul) from the «Atlas of Cities of the World». Vol.I. Fol.51. At the bottom of the plan are portraits of Turkish sultans, starting with the founder of the Ottoman dynasty - Osman (Ottoman, 1259–1324/1326). Fragment [fol. 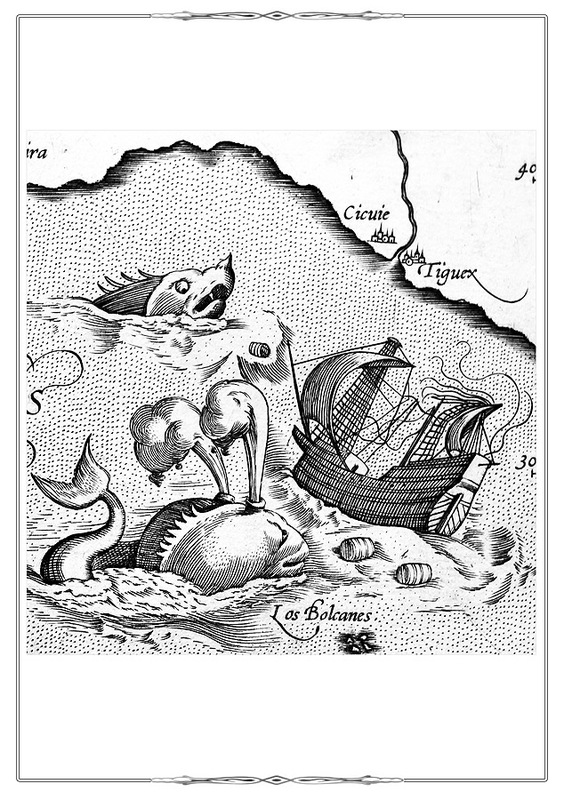 6] from the atlas Geographiae libri octo…. Amsterdam, 1605. Portrait of Gerard Mercator (1512-1594) after the engraving by Franz Hogenberg (1512-1594). Fragment fol. 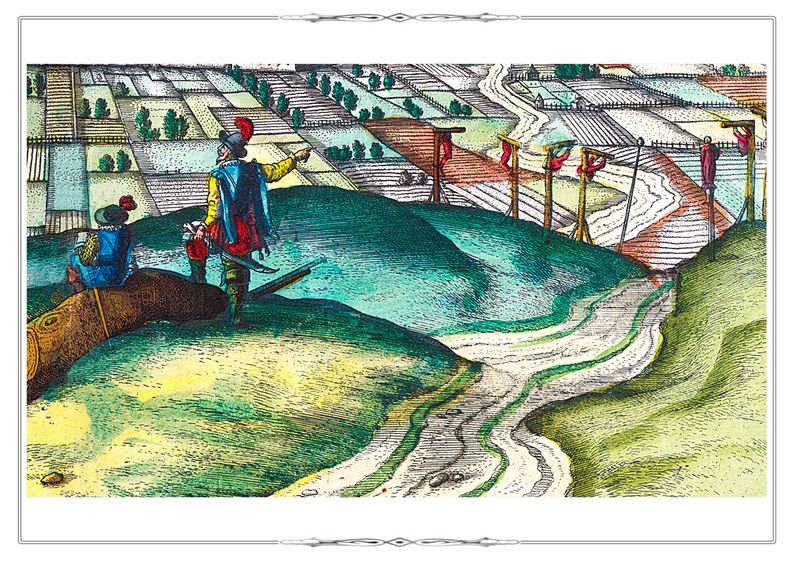 45 (a plan of the town of Kalwaria Zebrzydowska) from the atlas Civitates Orbis Terrarum. Köln, 1572-1618. Vol. 6. Portrait of Pope Paul V (1550-1621). Fragment fol. 18 from the atlas Civitates Orbis Terrarum. Köln, 1572-1618. Vol. 5. Urbium praecipvarum mundi theatrum quintum. Köln, [after 1598]. 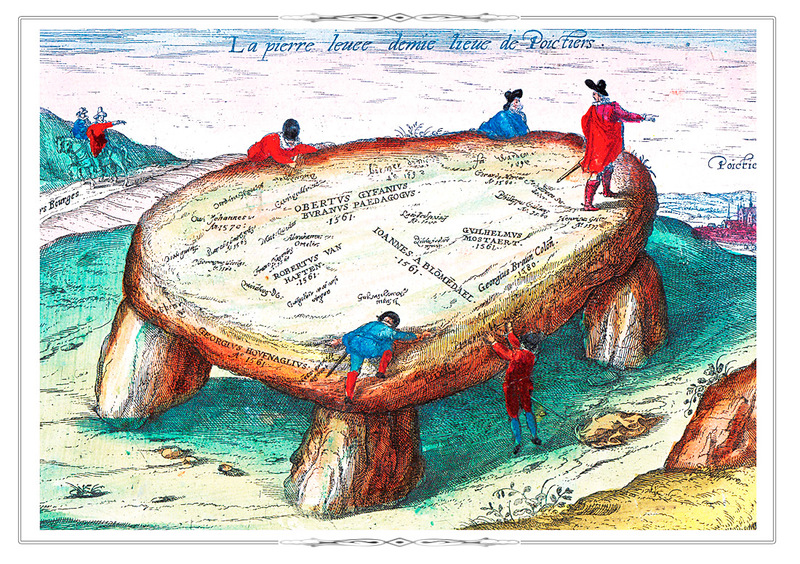 Dolmen of La Pierre-Levée located near the town of Poitiers is remarkable for autographs of the great sixteenth century cartographers such as Mercator, Ortelius, Hogenberg, Braun who inscribed their names in the stone while travelling in France. Fragment fol. 55 Civitates Orbis Terrarum. Köln, 1572-1618. Vol. III. Abraham Ortelius(1527-1598) and the Dutch artist J. Hufnagel (1542-1601). The engraving is inspired by memories of joint travels. 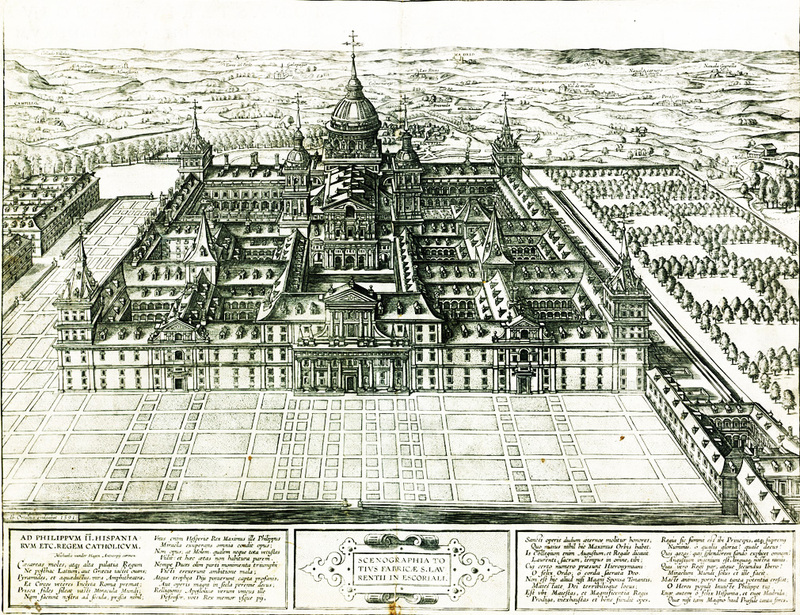 View of the Escorial - an architectural complex consisting of a royal monastery, palace and residence of King Philip II of Spain – from the atlas «Theatre of the World». [P. 384]. Fragment fol. 8 from the atlas Civitates Orbis Terrarum. Köln, 1572-1618. Vol. V. Urbium praecipvarum mundi theatrum quintum. Köln, [after 1598]. 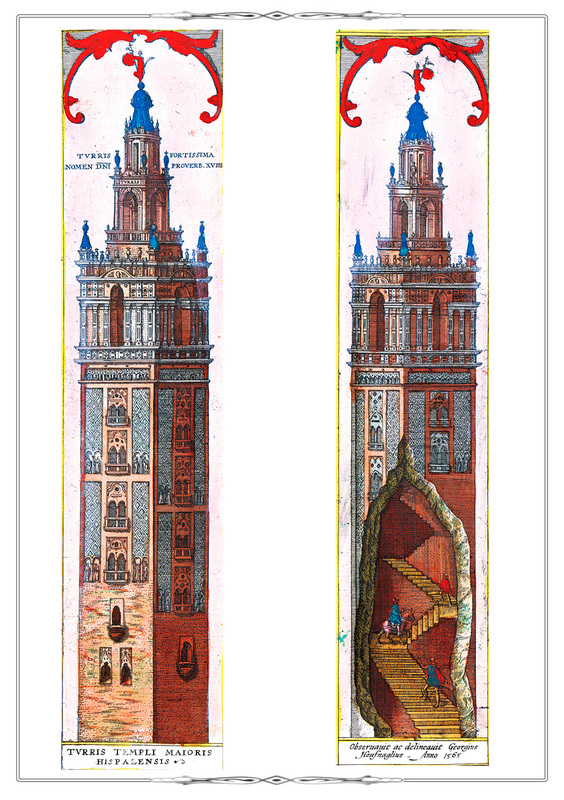 Giralda tower - the symbol of Seville. Fragment fol. 61 from the atlas Civitates Orbis Terrarum. Köln, 1572-1618. Vol. V. Urbium praecipvarum mundi theatrum quintum. Köln, [after 1598]. Villa of the Italian nobleman, cardinal and diplomat Alexander Farnese (1545-1592) in Caprarola (Italy). Fragment fol. 60 from the atlas Civitates Orbis Terrarum. Köln, 1572-1618. Vol. V. Urbium praecipvarum mundi theatrum quintum. Köln, [after 1598]. Fragment fol. 26 from the atlas Civitates Orbis Terrarum. Köln, 1572-1618. Vol. IV. Urbium praecipvarum totius mundi liber quartus 1588. Kronborg Castle is also widely known as "Elsinore" immortalized by William Shakespeare in his play Hamlet. Civitates Orbis Terrarum. Köln, 1588. Vol. I . F. 52. Plan of Jerusalem from the «Atlas of Cities of the World». Vol. I. Fol. 52. The picture in the bottom left corner illustrates the biblical story about Moses' Ascent of Mount Sinai where the prophet received from God the two stone tablets inscribed with the Ten Commandments. To the right is shown a high priest (Moses' brother Aaron became the first chief priest, according to the Bible). The vestments worn by high priests were very rich and elaborate, so the elements that make up these garments are described in detail in the text accompanying the illustration. Fragment [p. 144] from the atlas Theatrum orbis terrarum. Antverpen, 1584. Bible Scenes: the birth, crucifixion and resurrection of Christ. Fragment fol. 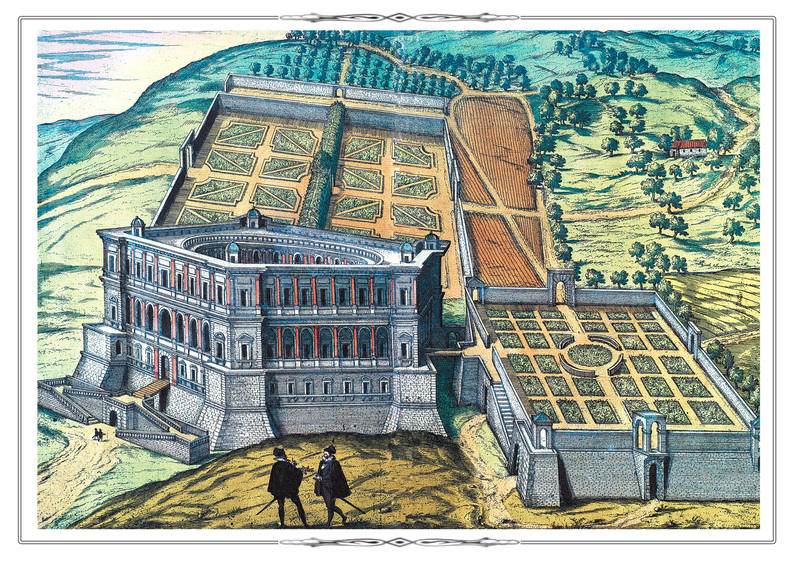 6 (a plan of the city San Sebastian) from the atlas Civitates Orbis Terrarum. Köln,1588. Vol. I.
San Sebastian (?-288) is a Roman legionary who believed in the teachings of Christ and was executed for it. Fragment fol. 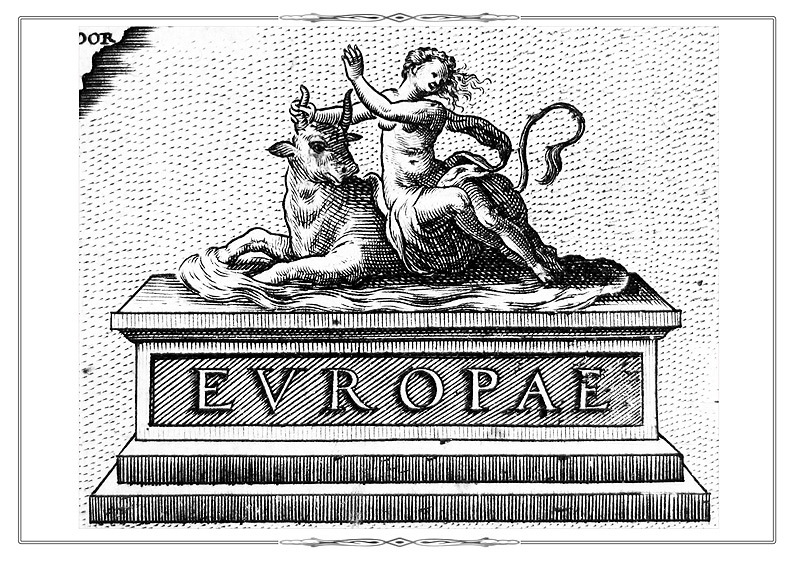 V from the atlas Abrahami Ortelii Theatri orbis terrarium parergon… Antverpen, 1624. Paul’s conversion to Christianity on the Damascus road when he was called to be an apostle. Scene of the Apostle Paul's shipwreck on Malta. The Apostle Paul miraculously escaped the death during his journey. 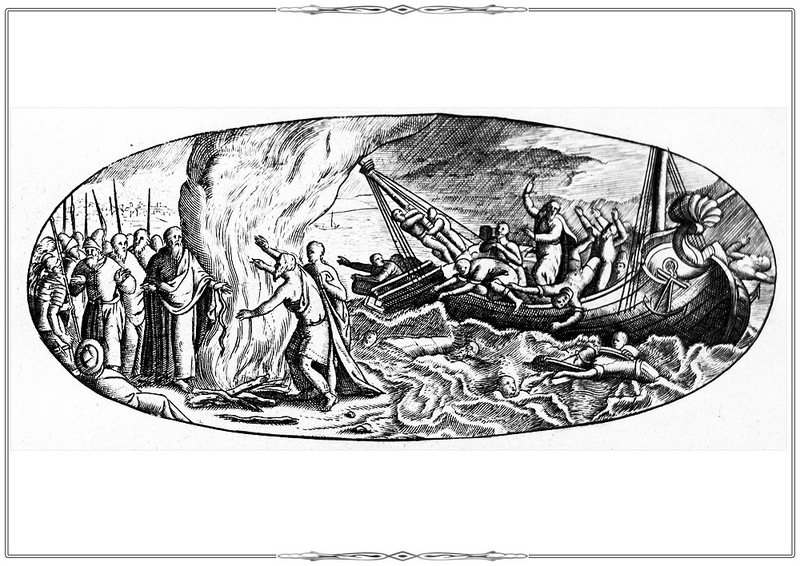 Now, the Feast of St. Paul’s Shipwreck is a public holiday celebrated in Malta. 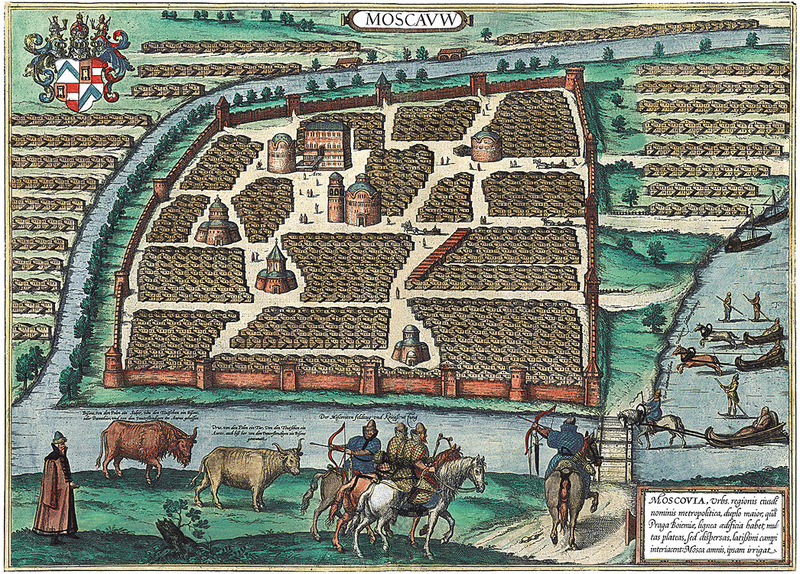 Plan of Moscow from volume II of the «Atlas of Cities of the World», fol. 47. The garments of Russian soldiers are fairly accurately depicted at the bottom of the plan. Fragment of p. 16 from the atlas Civitates Orbis Terrarum. Köln, 1572-1618. Vol. V. Urbium praecipvarum mundi theatrum quintum. Köln, [after 1598]. Fragment of p. 37 from the atlas Civitates Orbis Terrarum. Köln, 1572-1618. Vol.V. Urbium praecipvarum mundi theatrum quintum. Köln, [after 1598]. Fragment of p. 2 from the atlas Civitates Orbis Terrarum. Köln, 1572-1618. Vol. VI. Fragment of the title page of the atlas Civitates Orbis Terrarum. Köln, 1572-1618. Vol. V.
Urbium praecipvarum mundi theatrum quintum. Köln, [after 1598]. 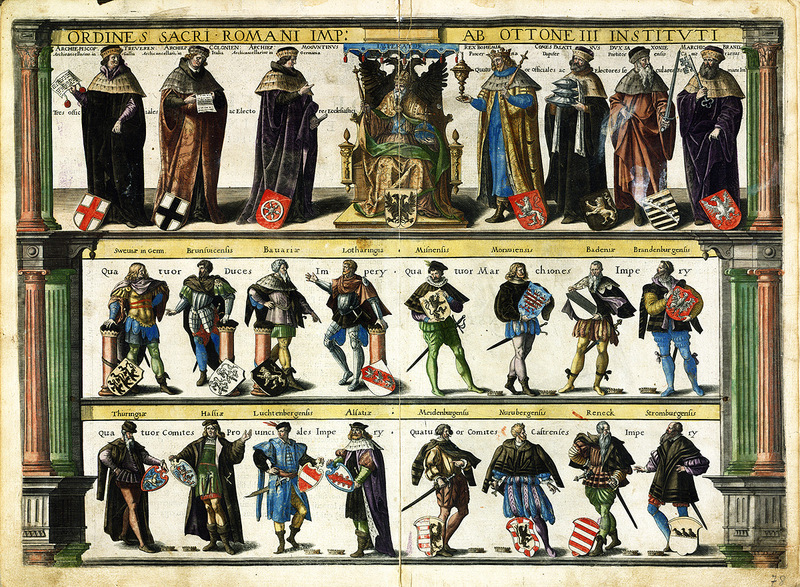 Folios Bb, Cc depicting the rulers of the Holy Roman Empire from the atlas Speculum orbis terrae. Antverpen, [1593-1613]. Fols. Bb, Cc. Theatrum orbis terrarum. Antverpen, 1570. Fol. 46. Map of Russia from the atlas «Theatre of the World». Fol. 46. 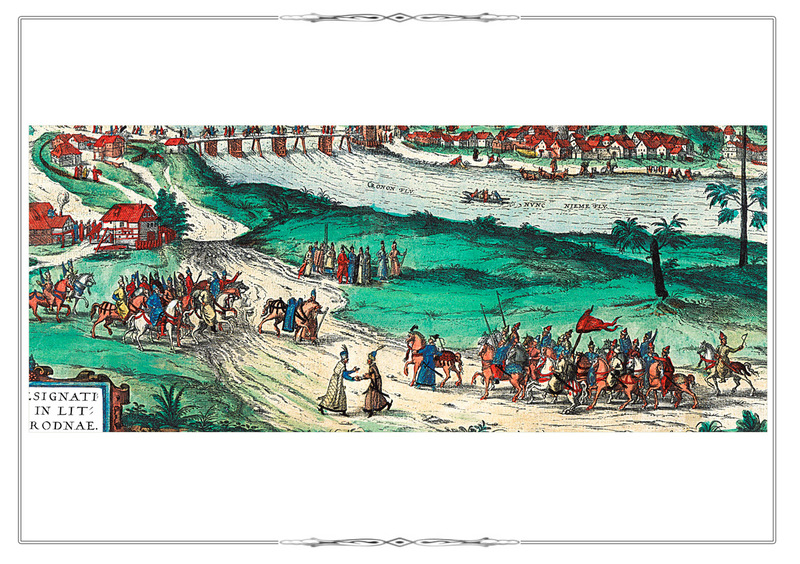 The map was compiled by the English merchant and diplomat Anthony Jenkinson, the British Ambassador in Russia. The well-studied European territory of the country is shown in detail. 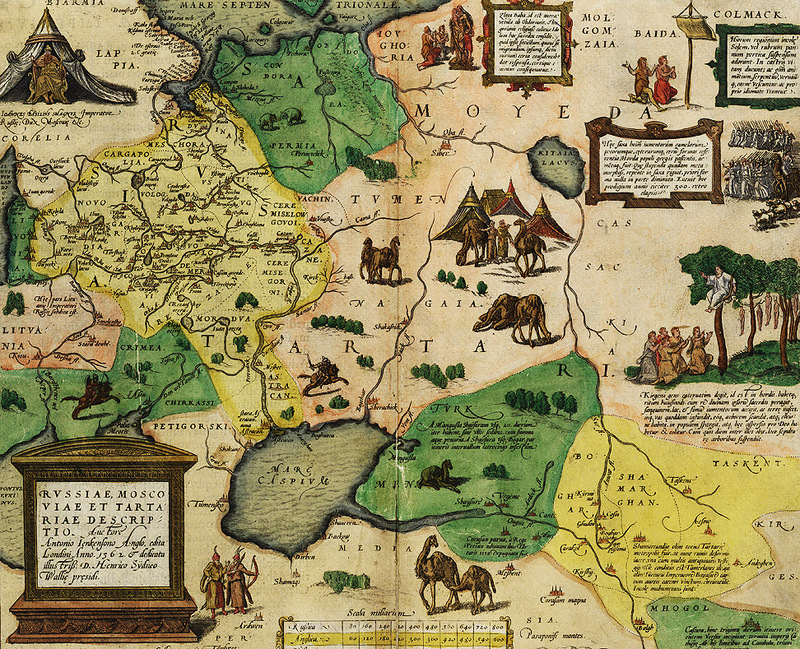 The part of the map representing the region beyond the Ural Mountains is mostly filled in by pictures and texts on various legends and beliefs, because this territory was known much worse. For instance, the map contains illustrations featuring worship of the Golden Woman (the female idol of the northen people), tribes who worship the sun etc. A portrait of Tsar Ivan the Terrible is located in the upper left coner. 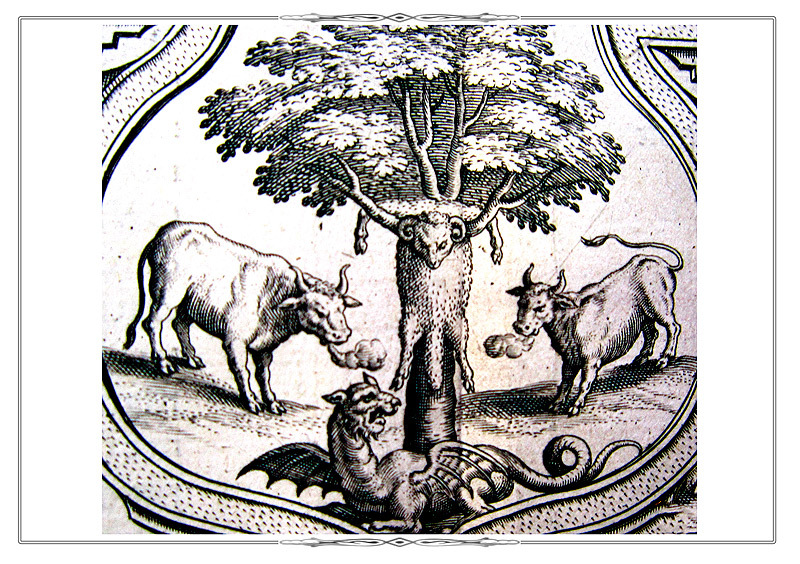 Fragment p. xlij from the atlas Abrahami Ortelii Theatri orbis terrarium parergon… Antverpen, 1624. Fragment p. 12 from the atlas Speculum orbis terrae. Antverpen, [1593-1613]. Fragment shows a dragon on the territory of the unknown southern continent. 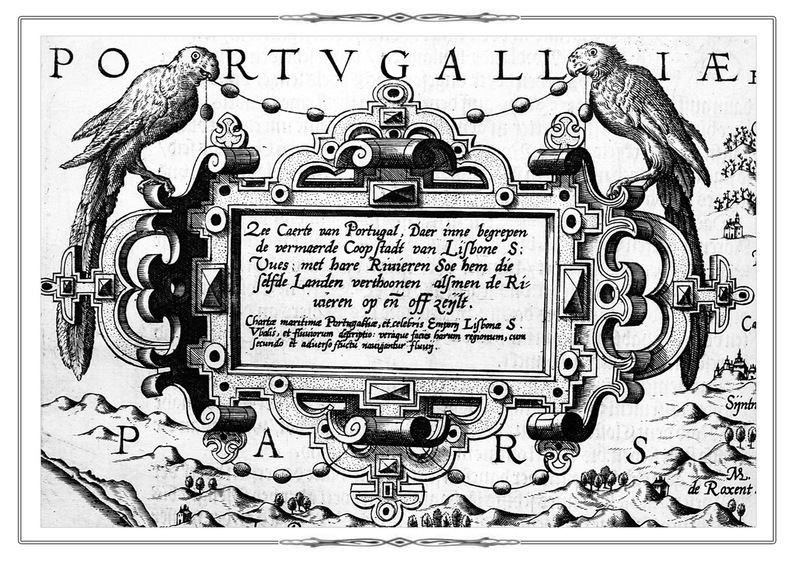 Fragment of the reverse side of the title sheet of the atlas Abrahami Ortelii Theatri orbis terrarium parergon… Antverpen, 1624. Civitates Orbis Terrarum. Köln, 1572-1618. Vol. III. Urbium praecipvarum totius mundi liber tertius (1588). F.23. Fol. 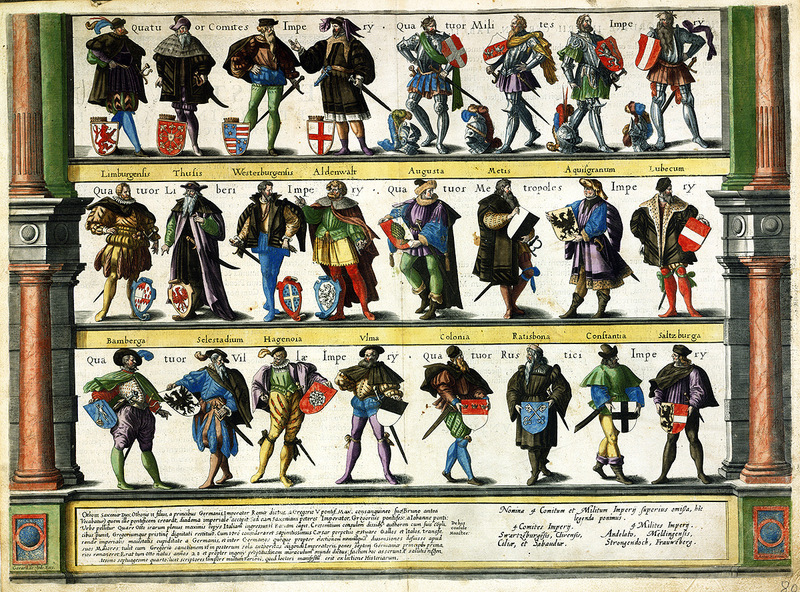 23 [Coats of Arms and Flags of cities, religious leaders and noble families from the province of Hainaut] from volume III of the «Atlas of Cities of the World». 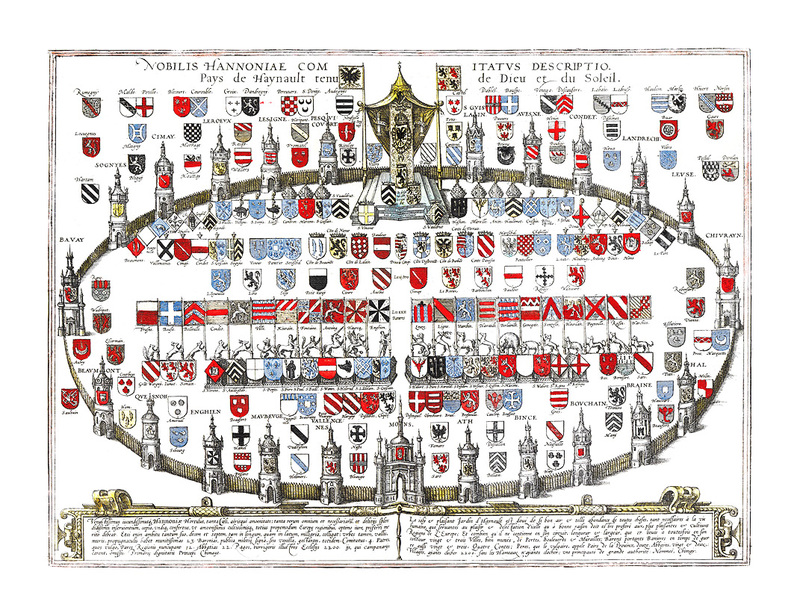 The central image at the top of the page is the Coats of Arms of the Holy Roman Empire and the province of Hainaut (now the province in Belgium). Fragments of fol. 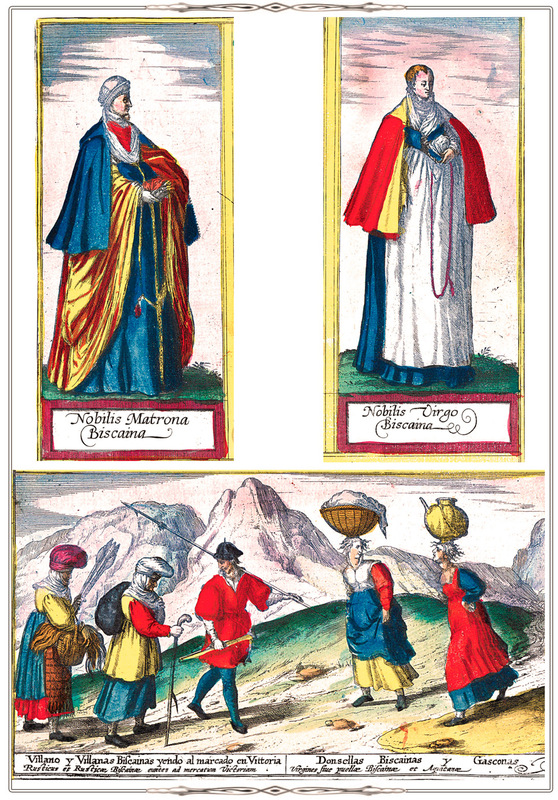 3 from of the atlas Civitates Orbis Terrarum. Köln, 1572-1618. Vol. III. 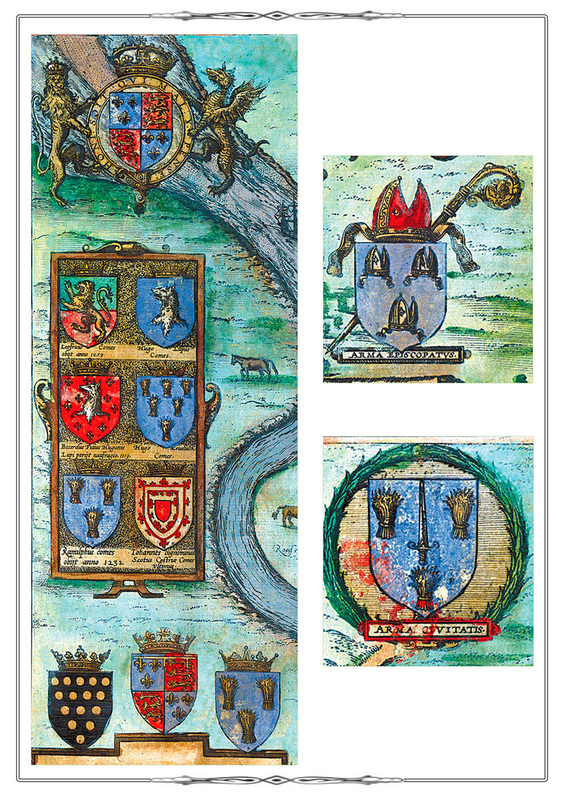 The coat of arms of the Great Britain and the coats of arms of the Earls of Chester are depicted on the left. On the right are the arms of Bishop of Chester and a former coat of arms of the Earldom of Chester. Fragments of fol. 42 from the atlas Civitates Orbis Terrarum. Köln, 1572-1618. Vol. VI. 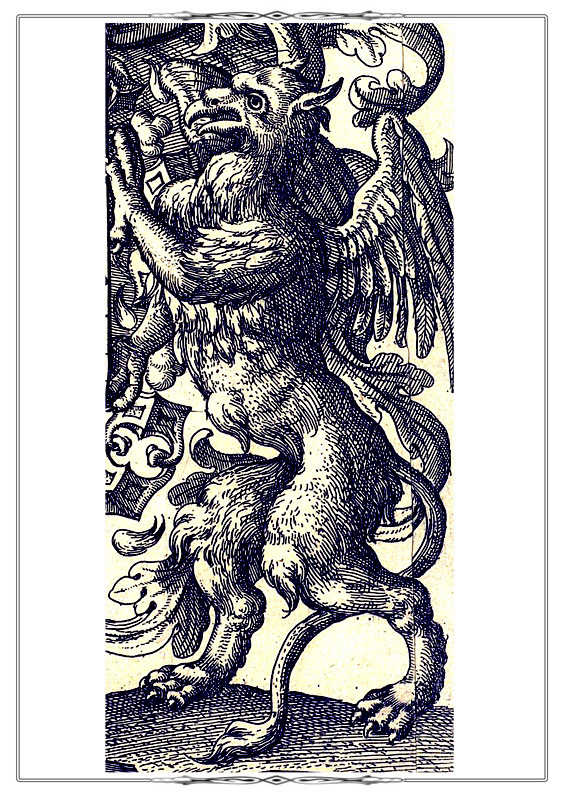 Image of the patron saint of Krakow St. Florian, armorials of the city of Krakow, Polish kings (from the House of Vasa), the Grand Duchy of Lithuania. Fragment fol. 35 from the atlas Civitates Orbis Terrarum. Köln, 1572-1618. Vol. VI. 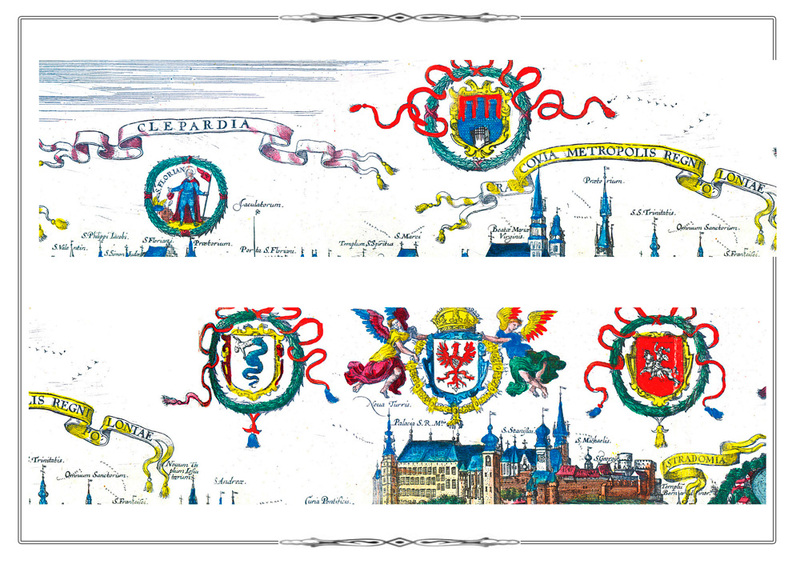 Coats of arms of the bishop of Bamberg, Bavaria and the city of Bamberg. Fragment fol. 21 from the atlas Civitates Orbis Terrarum. Köln, 1572-1618. Vol. II. De praecipues totius urbibus liber secundus. 1575. A fimale figure (Coat of Arms of Maastricht), holding the coats of arms of the bishop and the Kingdom of Spain. 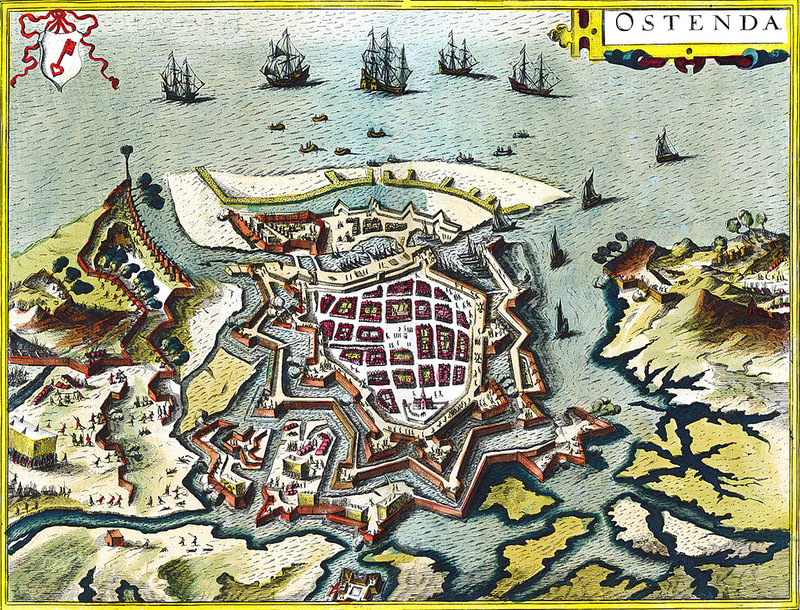 Plan of Ostend (now located in Belgium) from volume VI of the of the «Atlas of Cities of the World», fol. 11. 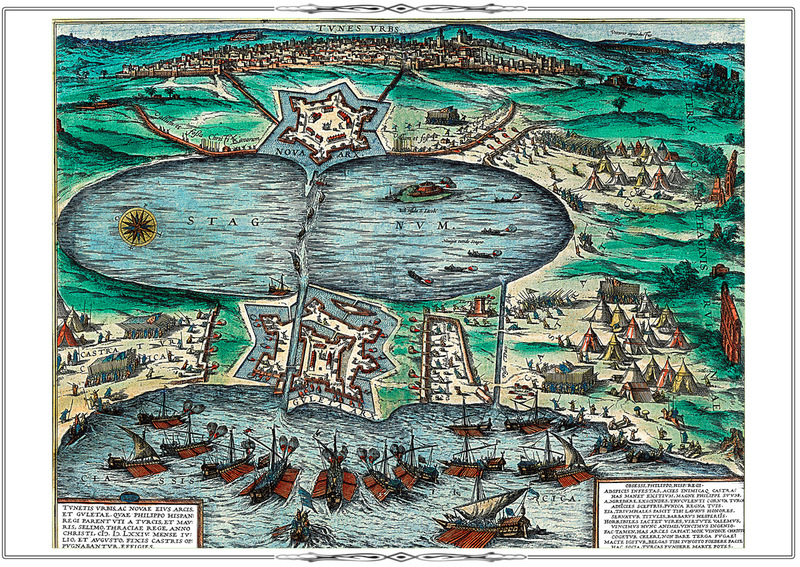 The plan features one of the most dramatic events in the history of the city - a three-year siege of Ostend by the Spanish troops wich lasted from 1601 to 1604 and resulted in a Spanish victory. 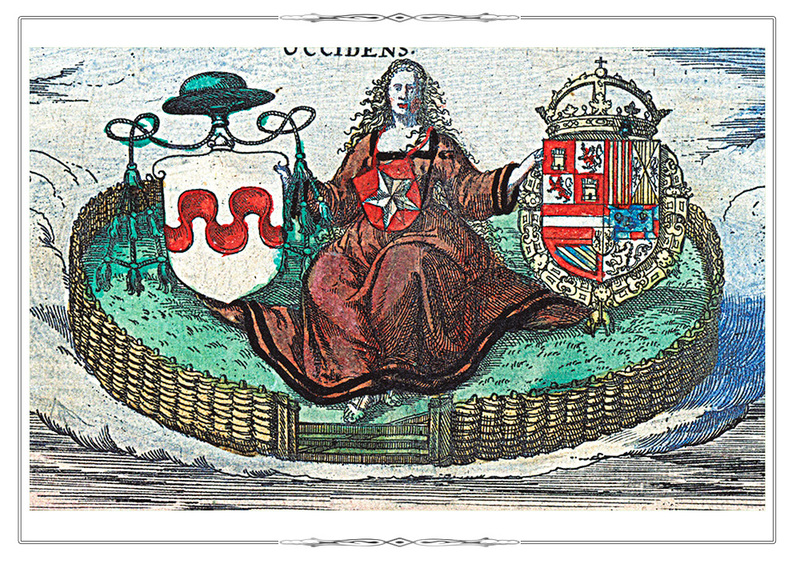 The coat of arms of Ostend is in the upper left corner. Fragment fol. 35 from volume VI of the atlas Civitates Orbis Terrarum. Köln, 1572-1618. Vol. VI. Theatrum praecipvarum totius mundi urbium liber sextus. 1617. Fragment the city of Pápa which was repeatedly besieged by Turkish troops. 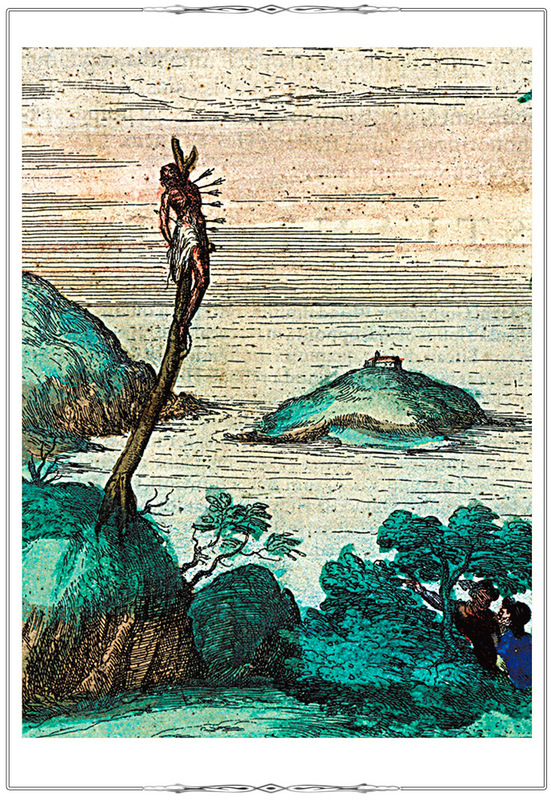 Probably, it depicts the events of 1597 when the city was liberated from the Turkish invaders, and the survivors of the Turks were brutally executed (impaled). Fragment fol. 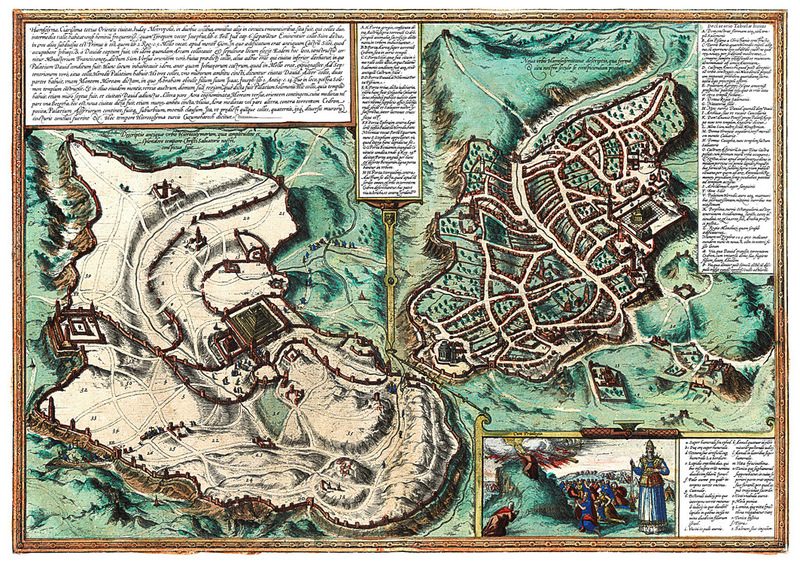 57 from volume II of the «Atlas of Cities of the World» (Civitates Orbis Terrarum. Köln, 1572-1618. Vol. II. De praecipues totius urbibus liber secundus. 1575. Map of the island Peñón de Vélez de la Gomera, through which the dividing line between the Spanish and Portuguese Possessions on the North African coast passed in the 16th century. Fragment fol. 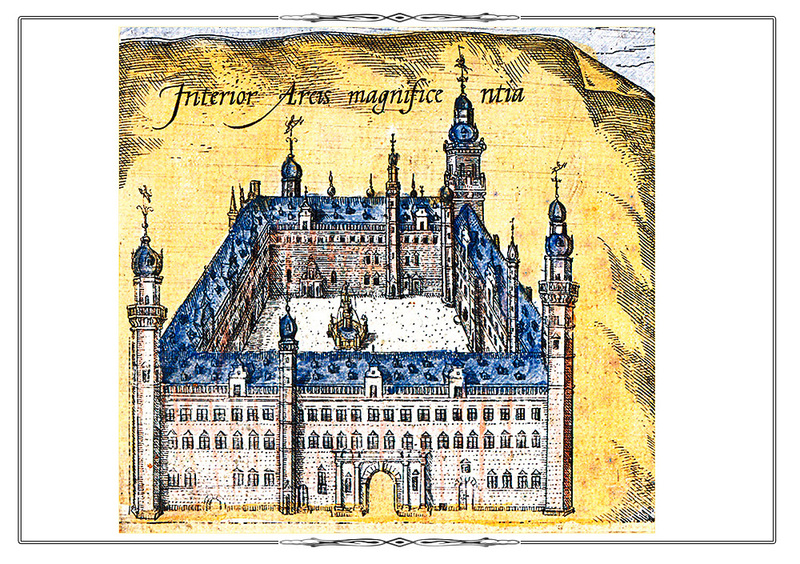 58 from volume II of the atlas Civitates Orbis Terrarum. Köln, 1572-1618. Vol. II. De praecipues totius urbibus liber secundus. 1575. 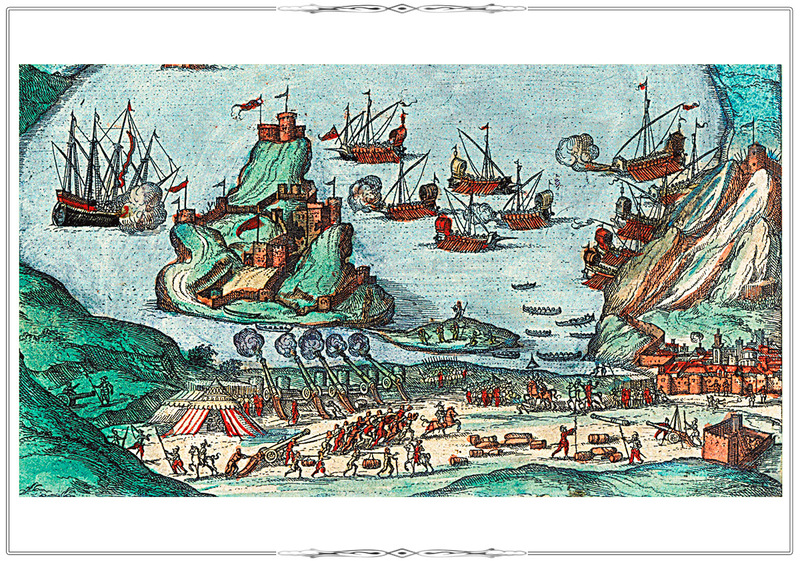 The plan of Tunis shows the battle between the troops of the Spanish King Philip II, protecting the city, and the Turkish military forces under the command of Sultan Selim in 1574. Fragment fol. 12 from the atlas Speculum orbis terrae. Antverpen, [1593-1613]. 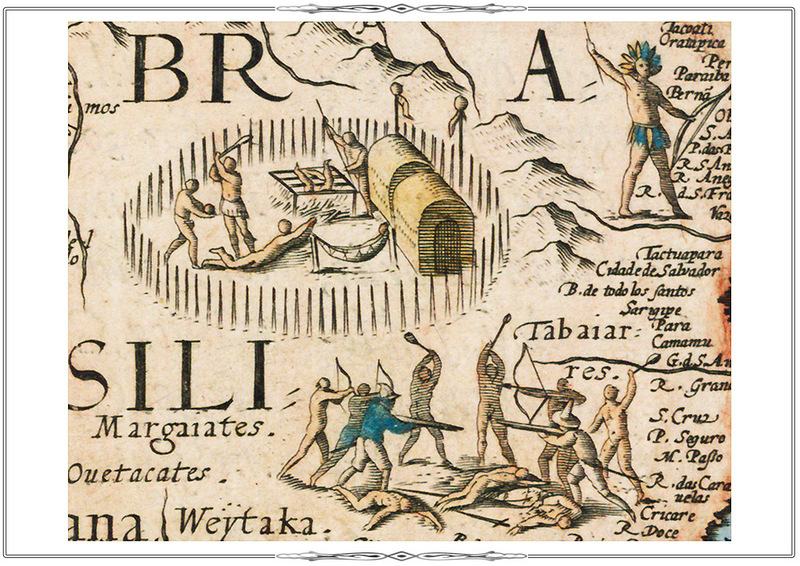 Skirmish between Europeans and natives in Brazil. Maps of North America (Quivira) and New Guinea from the world atlas «Mirror of the World». 1. 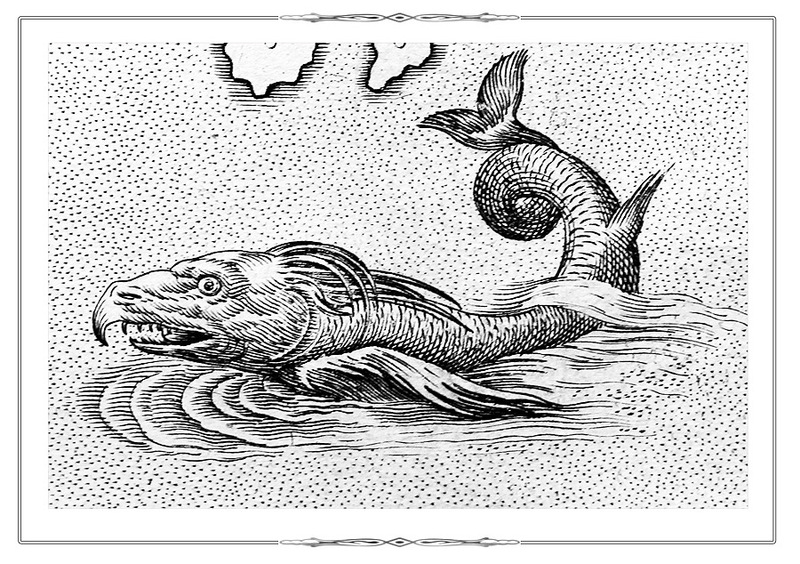 The mythical Quivira that never existed in reality was believed to be located in North America. According to legends, the inhabitants of this incredibly rich country use only gold and silver kitchen utensils. 2. The map shows the island of New Guinea and part of the unknown southern continent inhabited by monsters. On the right and left there are portraits of Pedro de Medina, the author of the book «The Art of Navigation» (1545), and the English mathematician Edward Wright noted for his book «Certaine Errors in Navigation» (1599). 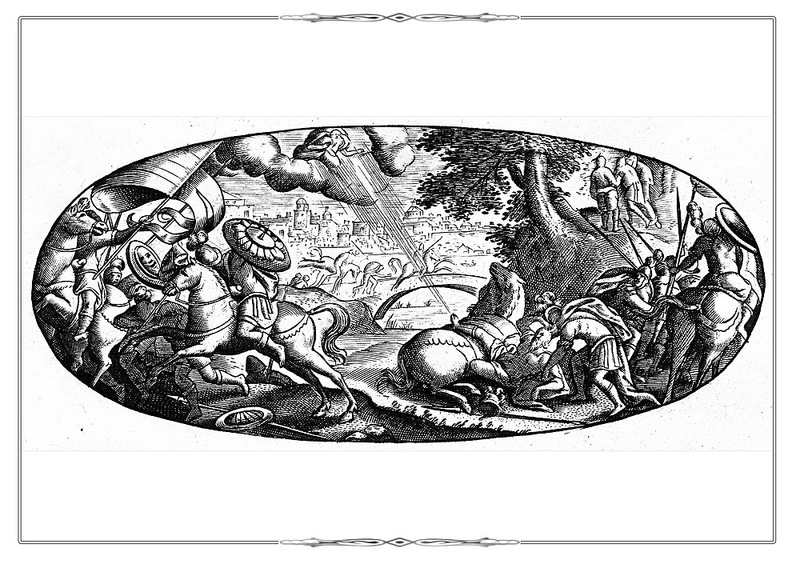 On the right there is the figure of Atlant holding a celestial globe on his shoulders.